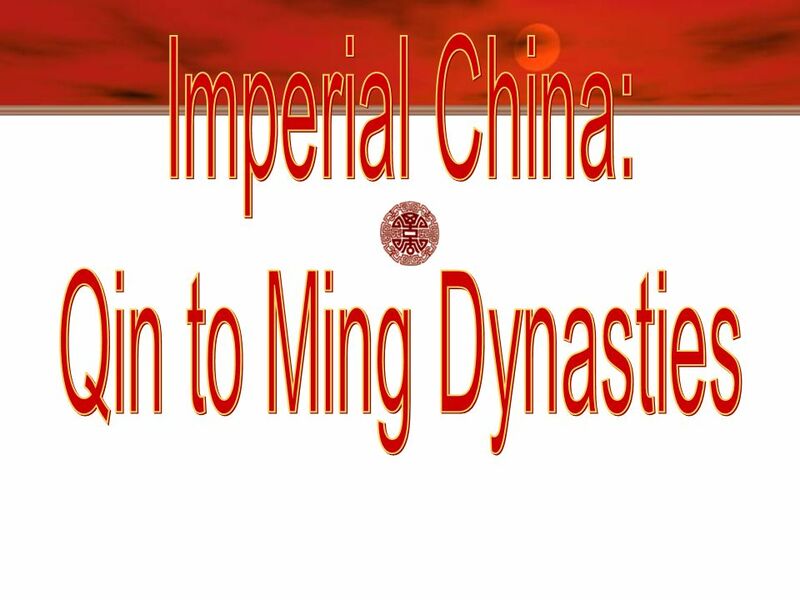 Imperial China: Qin to Ming Dynasties. 3 Qin [Ch’in] Dynasty, 221-206 B.C.E. 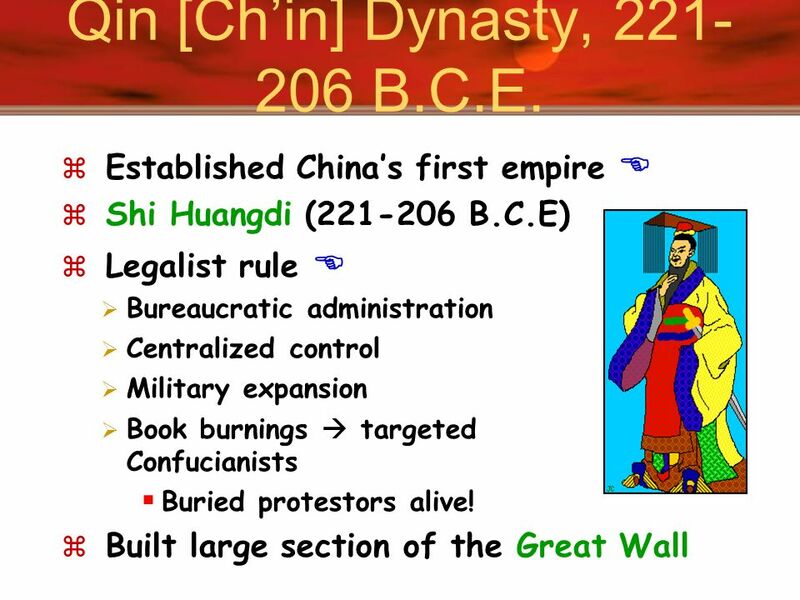 Established China’s first empire  Shi Huangdi ( B.C.E) Legalist rule  Bureaucratic administration Centralized control Military expansion Book burnings  targeted Confucianists Buried protestors alive! 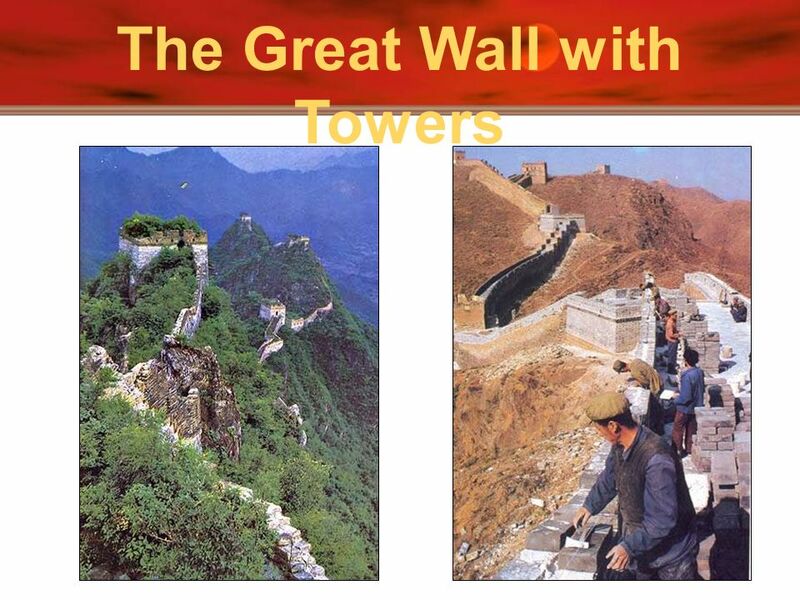 Built large section of the Great Wall Short-lived but very significant. Book burnings (including Confucius!) Millions of peasants were forced to build the Great Wall along the northern border. 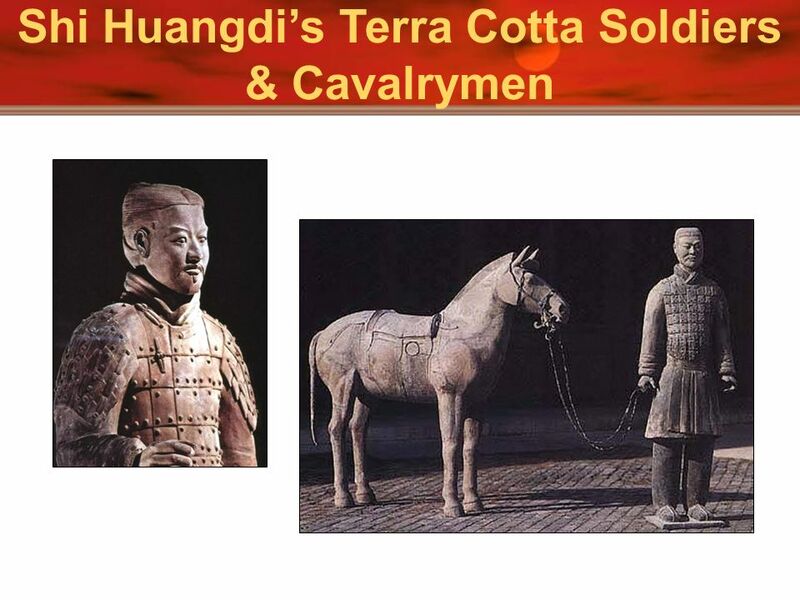 China, from Qin, developed as the name outsiders used to refer to China. 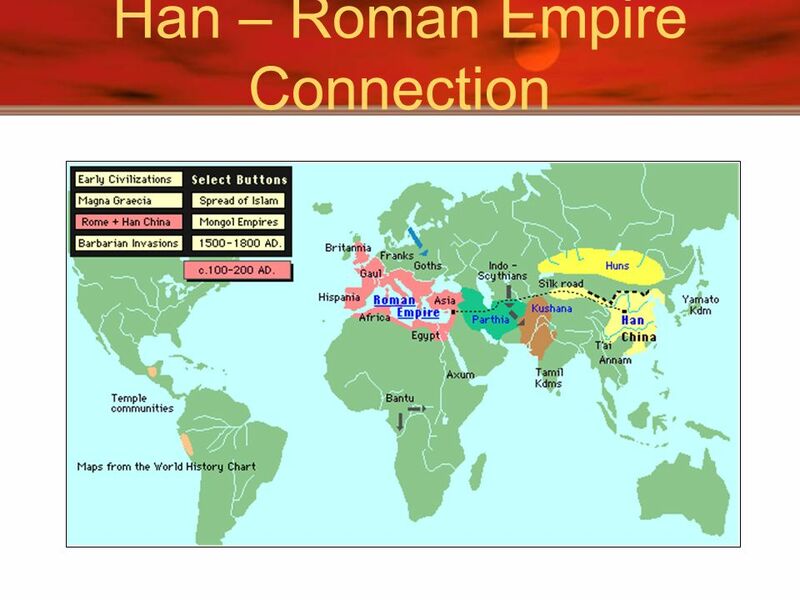 But the Chinese still refer to themselves as Han people. Note the western terminus at Jiayu Pass and the eastern terminus at Shanhai Pass. 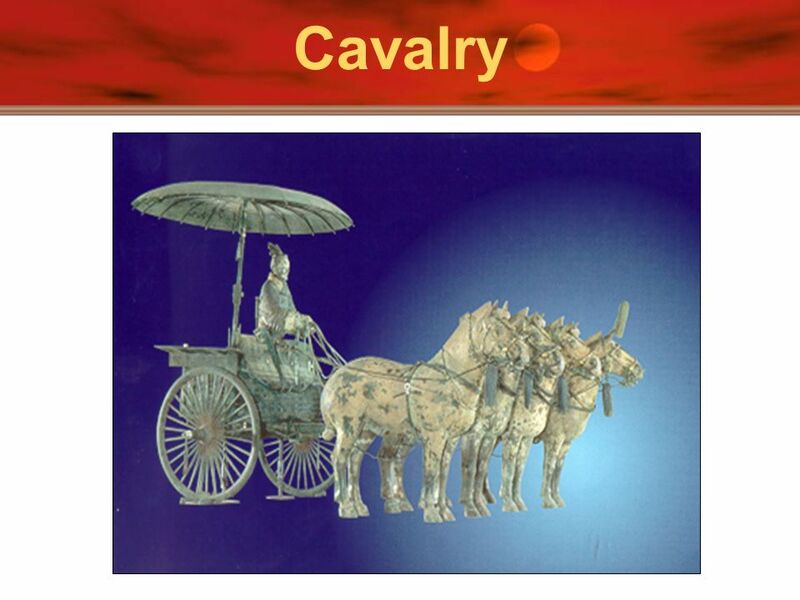 7 Cavalry Note the western terminus at Jiayu Pass and the eastern terminus at Shanhai Pass. 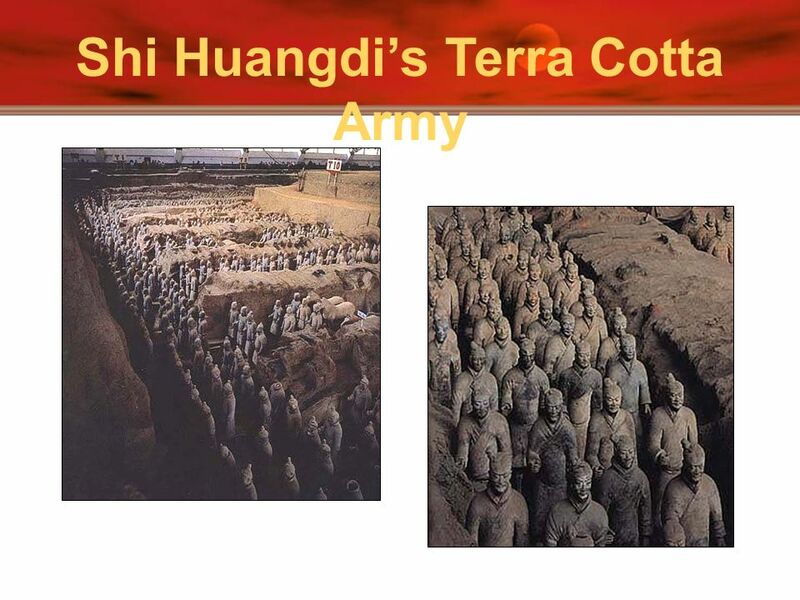 8 Individual Soldiers Note the western terminus at Jiayu Pass and the eastern terminus at Shanhai Pass. 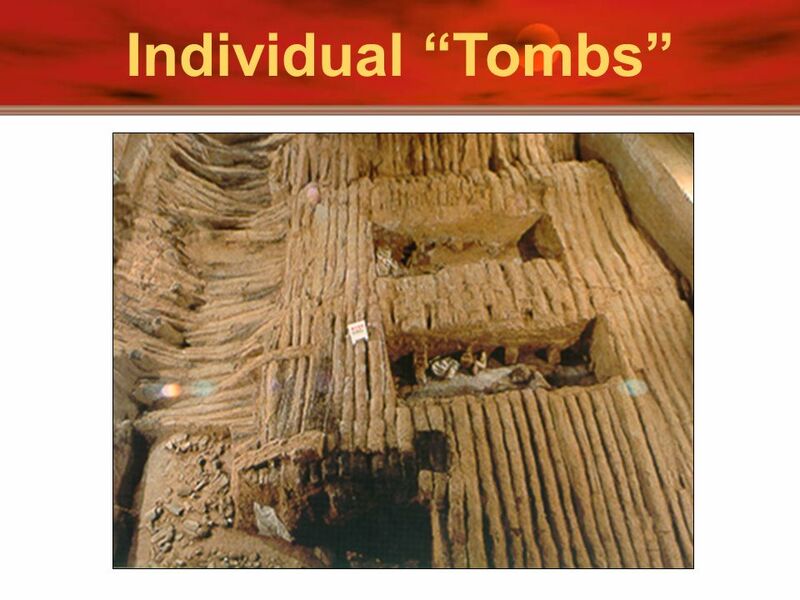 10 Individual “Tombs” Note the western terminus at Jiayu Pass and the eastern terminus at Shanhai Pass. 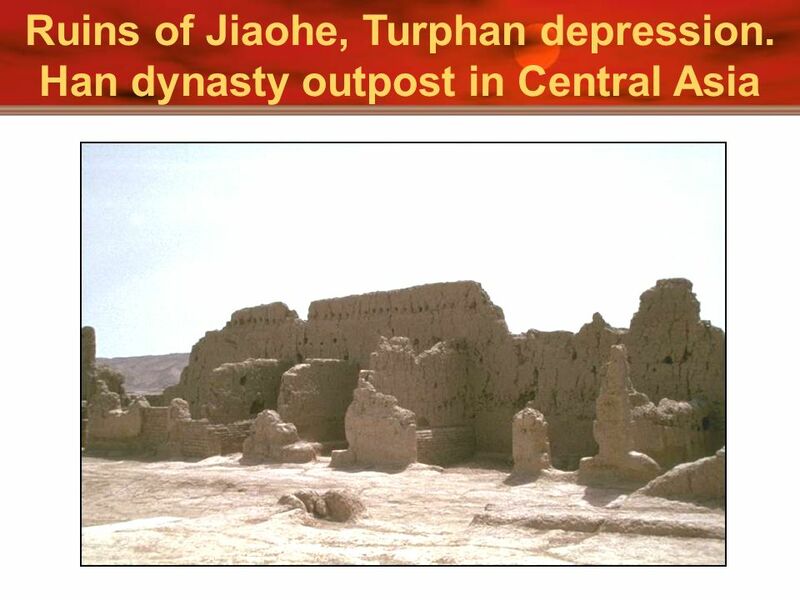 14 Han Dynasty, 206 B.C.E.-220 C.E. 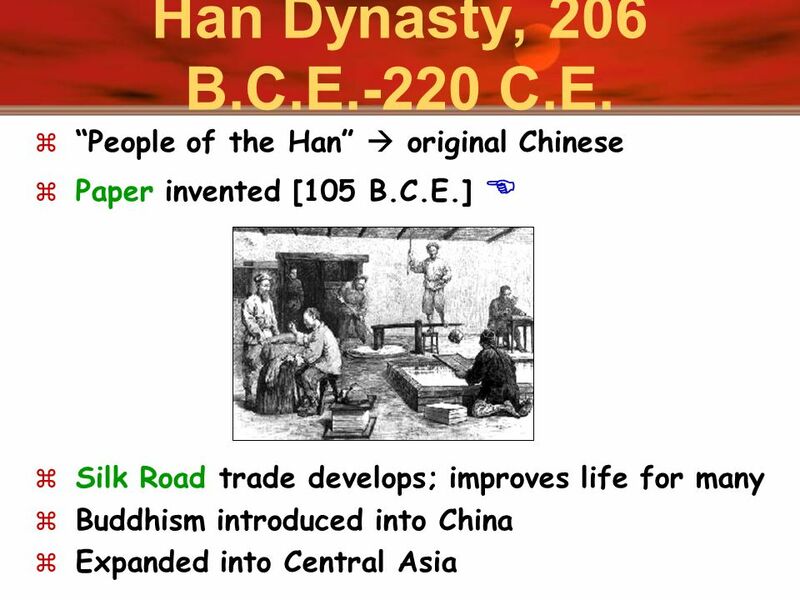 “People of the Han”  original Chinese Paper invented [105 B.C.E.] 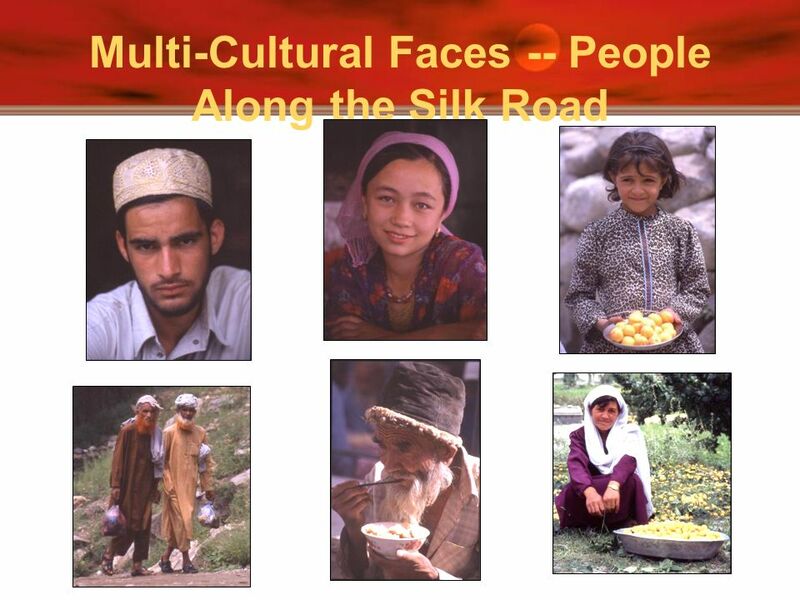  Silk Road trade develops; improves life for many Buddhism introduced into China Expanded into Central Asia The Han Synthesis term refers to the emphasis on Legalism, but with a touch of Confucianism. The Han dynasty recorded Confucius’s teachings (The Analects) and put a big emphasis on the family. Founded the Imperial University Required examinations to become bureaucrat (civil service system) Soldiers dropped to lowest status. Confucianists at work; Daoists at home. The Han tried to replace literature, including Confucius’s writings, lost during the Qin Dynasty. Created new works of literature and music. Scroll painting began during this time. Iron was now used for plows and weapons. Acupuncture was invented. Invented a crude seismic sensing tool, so they could send troops and food to the scene of an earthquake! Inventions include: paper (105 CE), sternpost rudder on ships, water mill, wheelbarrow, furrowed cultivation Show map for Silk Road trade. 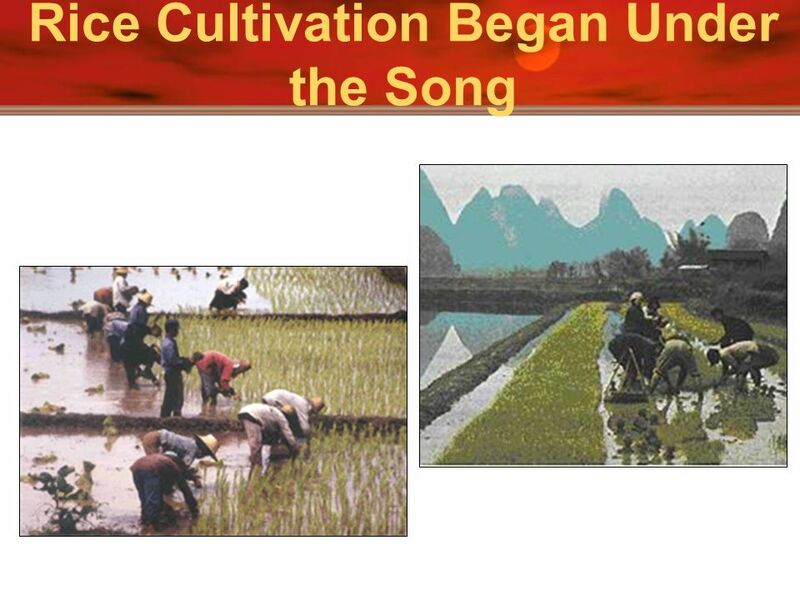 It brought Chinese together into one civilization, creating a common culture. 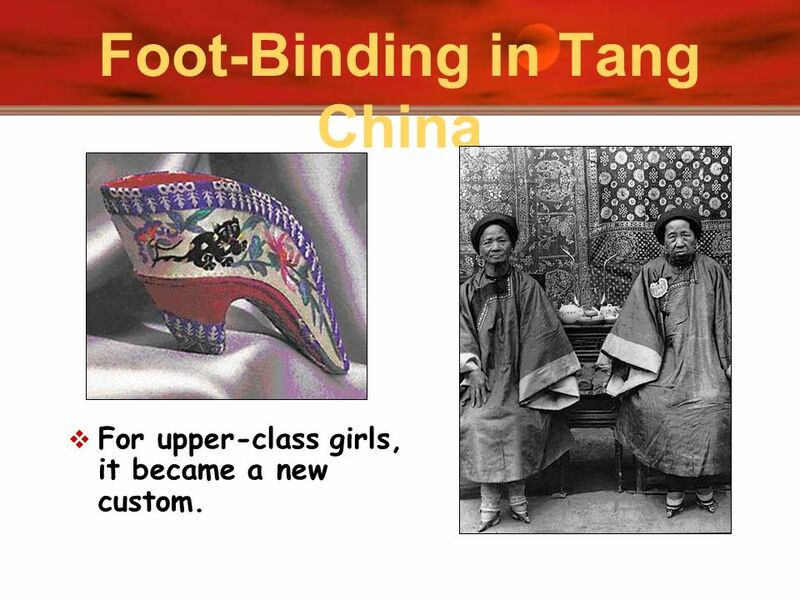 Economically, it brought much wealth to the Han, as they exported much more than they imported. Wudi’s public schools taught Confucianism. Grand School in capital. In 100 years, 30,000 studied there. 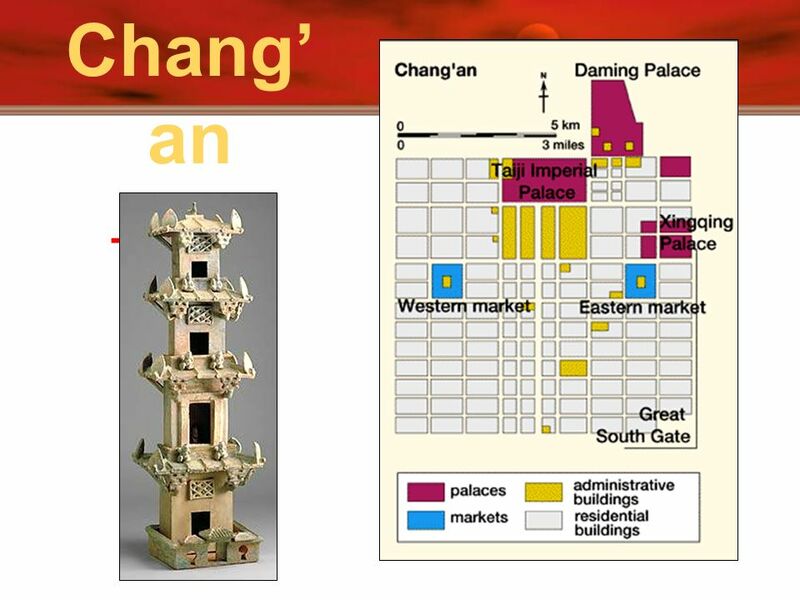 What about this map suggests that Chang’an was a city of an advanced civilization? Answers might include: Grid pattern. Palaces and administrative buildings suggest centralized governments. Markets suggest trade. 17 His jade suit has 2498 pieces! 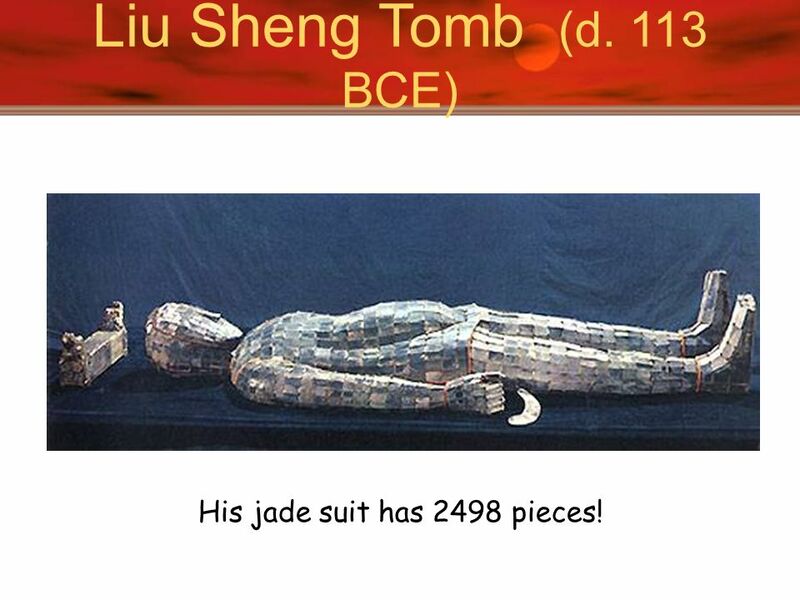 Liu Sheng Tomb (d. 113 BCE) His jade suit has 2498 pieces! 18 Emperor Wudi, 141-87 B.C.E. Started public schools. 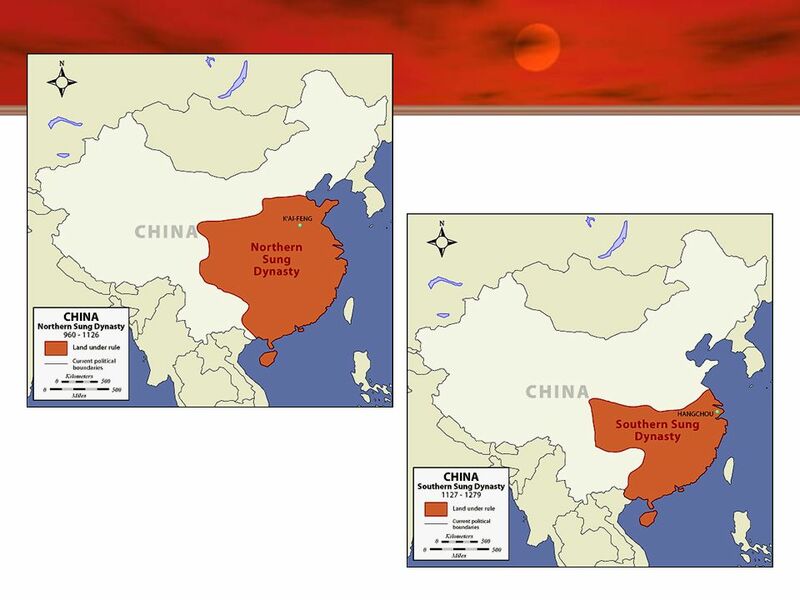 Colonized Manchuria, Korea, & Vietnam. 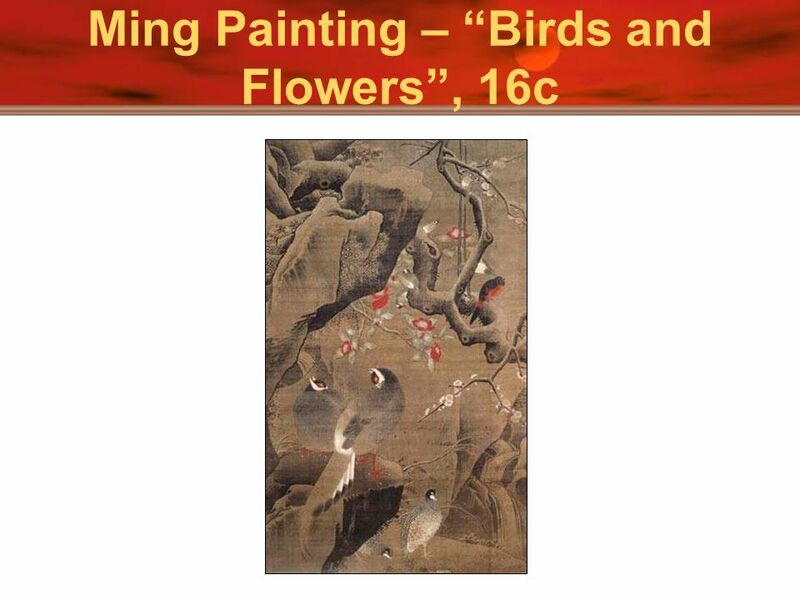 Civil service system  bureaucrats Confucian scholar-gentry Revival of Chinese landscape painting. The Han Synthesis term refers to the emphasis on Legalism, but with a touch of Confucianism. The Han dynasty recorded Confucius’s teachings (The Analects) and put a big emphasis on the family. Founded the Imperial University Required examinations to become bureaucrat (civil service system) Soldiers dropped to lowest status. Confucianists at work; Daoists at home. The Han tried to replace literature, including Confucius’s writings, lost during the Qin Dynasty. Created new works of literature and music. Scroll painting began during this time. Iron was now used for plows and weapons. Acupuncture was invented. Invented a crude seismic sensing tool, so they could send troops and food to the scene of an earthquake! Inventions include: paper (105 CE), sternpost rudder on ships, water mill, wheelbarrow, furrowed cultivation Show map for Silk Road trade. It brought Chinese together into one civilization, creating a common culture. Economically, it brought much wealth to the Han, as they exported much more than they imported. Wudi’s public schools taught Confucianism. Grand School in capital. In 100 years, 30,000 studied there. 25 Sui Dynasty, C.E. 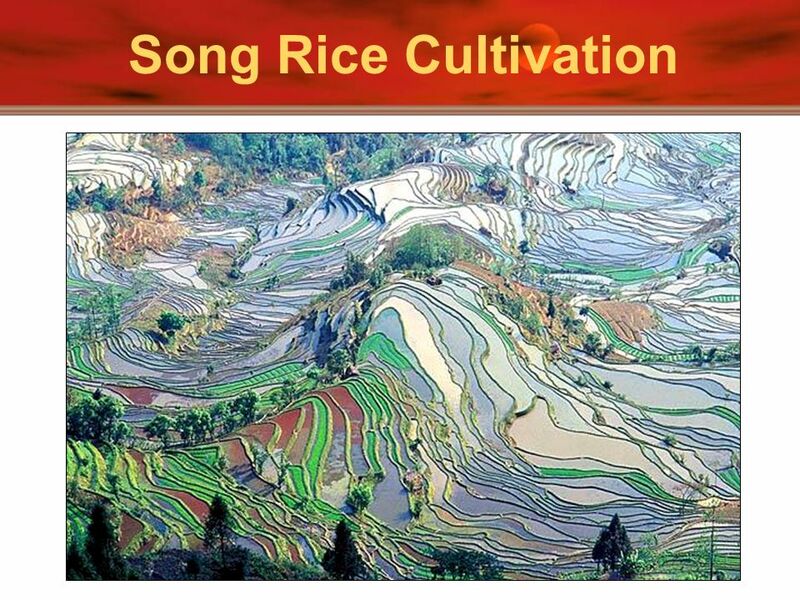 “Land Equalization” System  land redistribution. Unified coinage. Grand Canal constructed. Established an army of professional soldiers. People were overworked and overtaxed! The Han Synthesis term refers to the emphasis on Legalism, but with a touch of Confucianism. The Han dynasty recorded Confucius’s teachings (The Analects) and put a big emphasis on the family. Founded the Imperial University Required examinations to become bureaucrat (civil service system) Soldiers dropped to lowest status. Confucianists at work; Daoists at home. 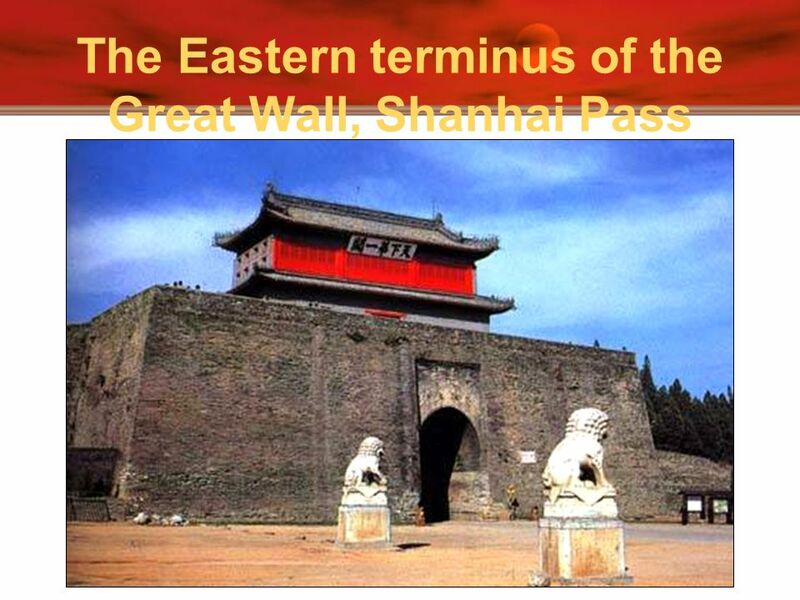 The Han tried to replace literature, including Confucius’s writings, lost during the Qin Dynasty. Created new works of literature and music. Scroll painting began during this time. Iron was now used for plows and weapons. Acupuncture was invented. Invented a crude seismic sensing tool, so they could send troops and food to the scene of an earthquake! Inventions include: paper (105 CE), sternpost rudder on ships, water mill, wheelbarrow, furrowed cultivation Show map for Silk Road trade. 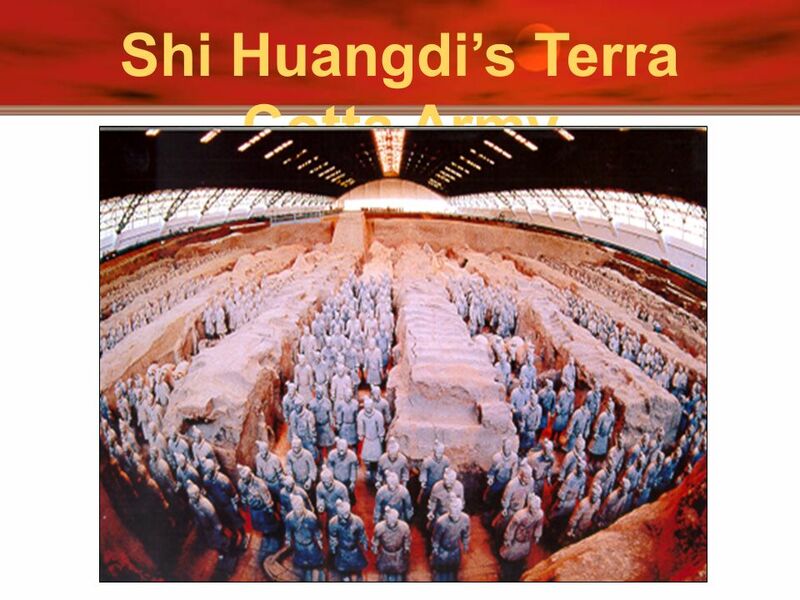 It brought Chinese together into one civilization, creating a common culture. Economically, it brought much wealth to the Han, as they exported much more than they imported. Wudi’s public schools taught Confucianism. Grand School in capital. In 100 years, 30,000 studied there. 27 The Grand Canal Today Above is a picture of Suzhou in Jiangsu province showing houses along the Grand Canal. 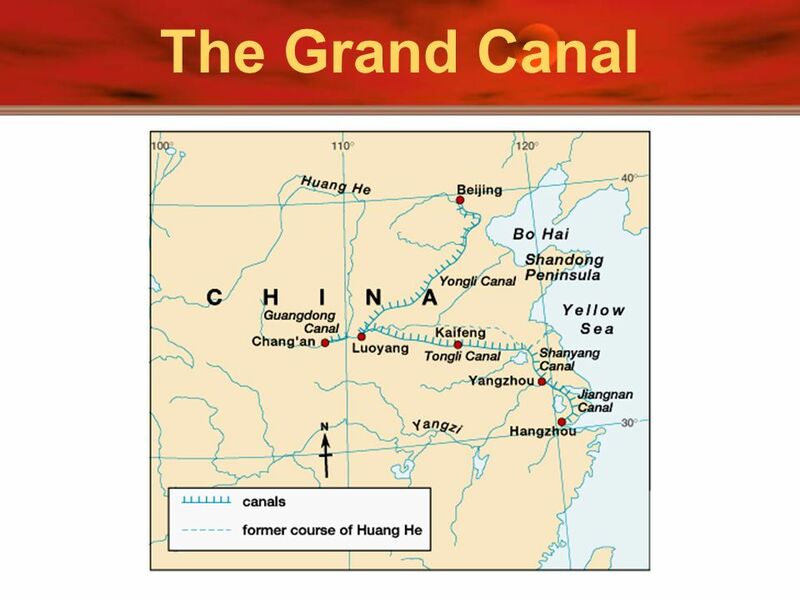 From north to south, the Grand Canal is over 1,700 kilometers (roughly 1,100 miles) long, linking Hangzhou in Zhejiang province with Beijing in the north. An extremely important water project that was first started in the Sui dynasty ( ), it connects several big rivers and provides an important means of transportation and communication. With the two pictures below in mind, how do you think the access to rivers and lakes would have made the lifestyle of people in the south different from that of people in the north? 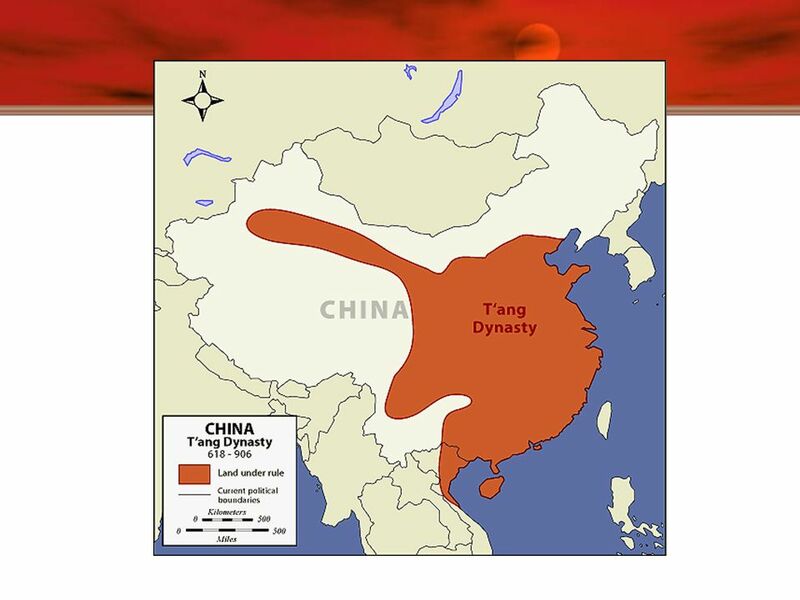 29 Tang Dynasty, 618-907 C.E. Imperial examination system perfected. Liberal attitude towards all religions. 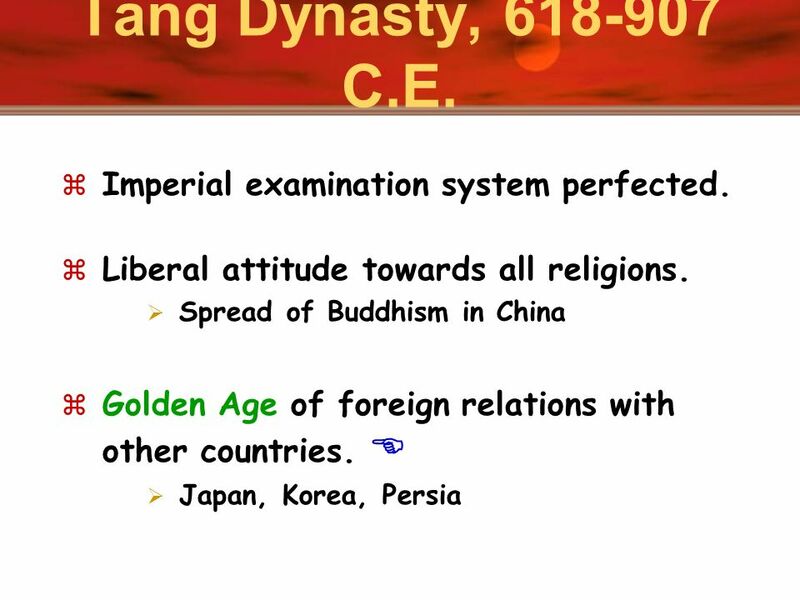 Spread of Buddhism in China Golden Age of foreign relations with other countries. 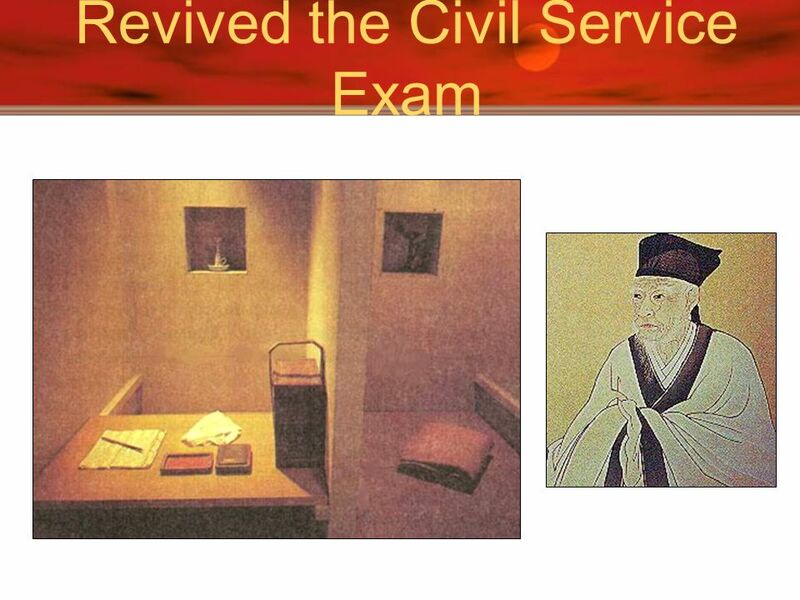  Japan, Korea, Persia The Han Synthesis term refers to the emphasis on Legalism, but with a touch of Confucianism. The Han dynasty recorded Confucius’s teachings (The Analects) and put a big emphasis on the family. Founded the Imperial University Required examinations to become bureaucrat (civil service system) Soldiers dropped to lowest status. Confucianists at work; Daoists at home. The Han tried to replace literature, including Confucius’s writings, lost during the Qin Dynasty. Created new works of literature and music. Scroll painting began during this time. Iron was now used for plows and weapons. 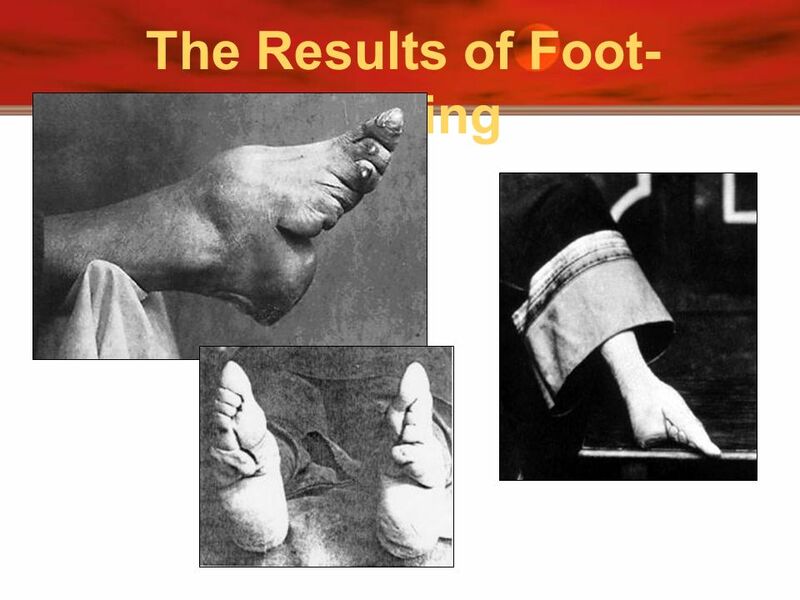 Acupuncture was invented. Invented a crude seismic sensing tool, so they could send troops and food to the scene of an earthquake! Inventions include: paper (105 CE), sternpost rudder on ships, water mill, wheelbarrow, furrowed cultivation Show map for Silk Road trade. It brought Chinese together into one civilization, creating a common culture. Economically, it brought much wealth to the Han, as they exported much more than they imported. Wudi’s public schools taught Confucianism. Grand School in capital. In 100 years, 30,000 studied there. The Han Synthesis term refers to the emphasis on Legalism, but with a touch of Confucianism. The Han dynasty recorded Confucius’s teachings (The Analects) and put a big emphasis on the family. Founded the Imperial University Required examinations to become bureaucrat (civil service system) Soldiers dropped to lowest status. Confucianists at work; Daoists at home. The Han tried to replace literature, including Confucius’s writings, lost during the Qin Dynasty. Created new works of literature and music. Scroll painting began during this time. Iron was now used for plows and weapons. Acupuncture was invented. Invented a crude seismic sensing tool, so they could send troops and food to the scene of an earthquake! Inventions include: paper (105 CE), sternpost rudder on ships, water mill, wheelbarrow, furrowed cultivation Show map for Silk Road trade. It brought Chinese together into one civilization, creating a common culture. Economically, it brought much wealth to the Han, as they exported much more than they imported. Wudi’s public schools taught Confucianism. Grand School in capital. In 100 years, 30,000 studied there. 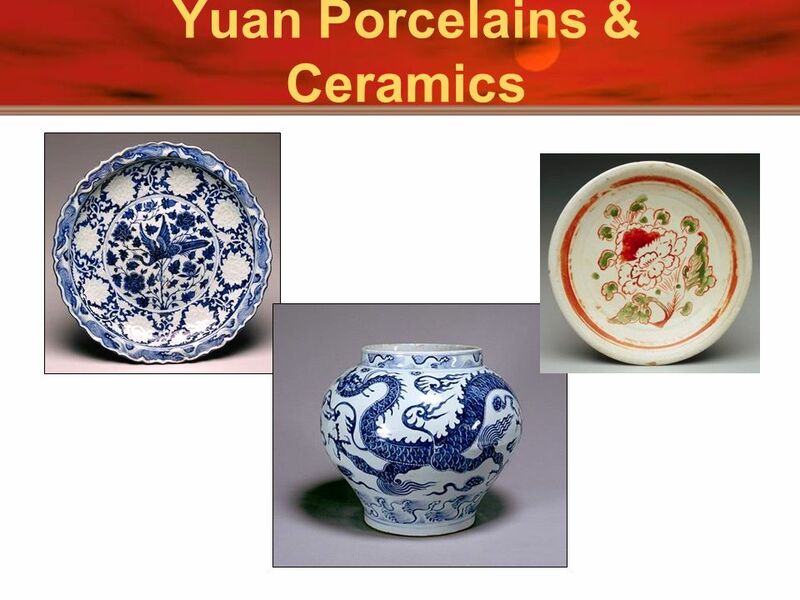 Printing  moveable print  Porcelain Gunpowder Mechanical clocks More cosmopolitan culture. 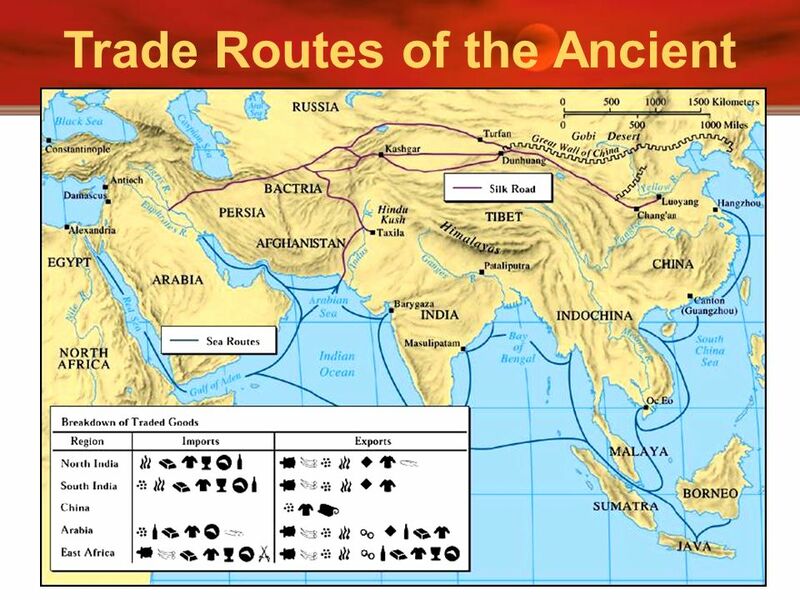 Reestablished the safety of the Silk Road. Tea comes into China from Southeast Asia. 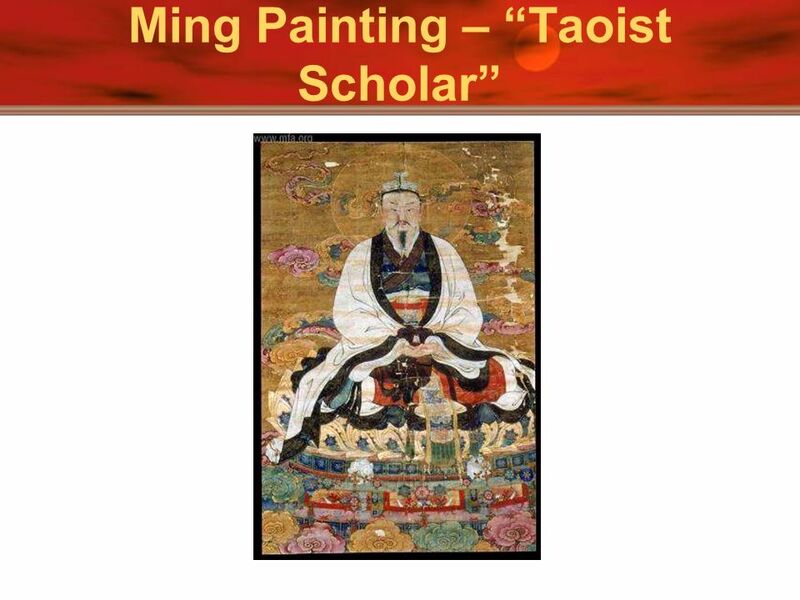  The Han Synthesis term refers to the emphasis on Legalism, but with a touch of Confucianism. The Han dynasty recorded Confucius’s teachings (The Analects) and put a big emphasis on the family. Founded the Imperial University Required examinations to become bureaucrat (civil service system) Soldiers dropped to lowest status. Confucianists at work; Daoists at home. The Han tried to replace literature, including Confucius’s writings, lost during the Qin Dynasty. Created new works of literature and music. Scroll painting began during this time. Iron was now used for plows and weapons. Acupuncture was invented. Invented a crude seismic sensing tool, so they could send troops and food to the scene of an earthquake! Inventions include: paper (105 CE), sternpost rudder on ships, water mill, wheelbarrow, furrowed cultivation Show map for Silk Road trade. It brought Chinese together into one civilization, creating a common culture. Economically, it brought much wealth to the Han, as they exported much more than they imported. Wudi’s public schools taught Confucianism. Grand School in capital. In 100 years, 30,000 studied there. 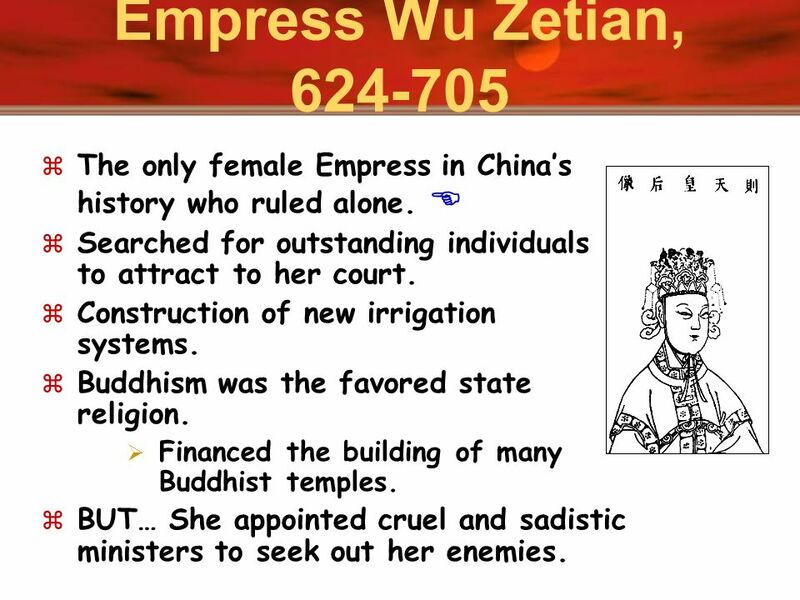 32 Empress Wu Zetian, The only female Empress in China’s history who ruled alone.  Searched for outstanding individuals to attract to her court. Construction of new irrigation systems. Buddhism was the favored state religion. Financed the building of many Buddhist temples. BUT… She appointed cruel and sadistic ministers to seek out her enemies. The Han Synthesis term refers to the emphasis on Legalism, but with a touch of Confucianism. The Han dynasty recorded Confucius’s teachings (The Analects) and put a big emphasis on the family. Founded the Imperial University Required examinations to become bureaucrat (civil service system) Soldiers dropped to lowest status. Confucianists at work; Daoists at home. The Han tried to replace literature, including Confucius’s writings, lost during the Qin Dynasty. Created new works of literature and music. Scroll painting began during this time. Iron was now used for plows and weapons. Acupuncture was invented. Invented a crude seismic sensing tool, so they could send troops and food to the scene of an earthquake! Inventions include: paper (105 CE), sternpost rudder on ships, water mill, wheelbarrow, furrowed cultivation Show map for Silk Road trade. It brought Chinese together into one civilization, creating a common culture. Economically, it brought much wealth to the Han, as they exported much more than they imported. Wudi’s public schools taught Confucianism. Grand School in capital. In 100 years, 30,000 studied there. The Han Synthesis term refers to the emphasis on Legalism, but with a touch of Confucianism. The Han dynasty recorded Confucius’s teachings (The Analects) and put a big emphasis on the family. Founded the Imperial University Required examinations to become bureaucrat (civil service system) Soldiers dropped to lowest status. Confucianists at work; Daoists at home. The Han tried to replace literature, including Confucius’s writings, lost during the Qin Dynasty. Created new works of literature and music. Scroll painting began during this time. Iron was now used for plows and weapons. Acupuncture was invented. Invented a crude seismic sensing tool, so they could send troops and food to the scene of an earthquake! Inventions include: paper (105 CE), sternpost rudder on ships, water mill, wheelbarrow, furrowed cultivation Show map for Silk Road trade. It brought Chinese together into one civilization, creating a common culture. Economically, it brought much wealth to the Han, as they exported much more than they imported. Wudi’s public schools taught Confucianism. Grand School in capital. In 100 years, 30,000 studied there. 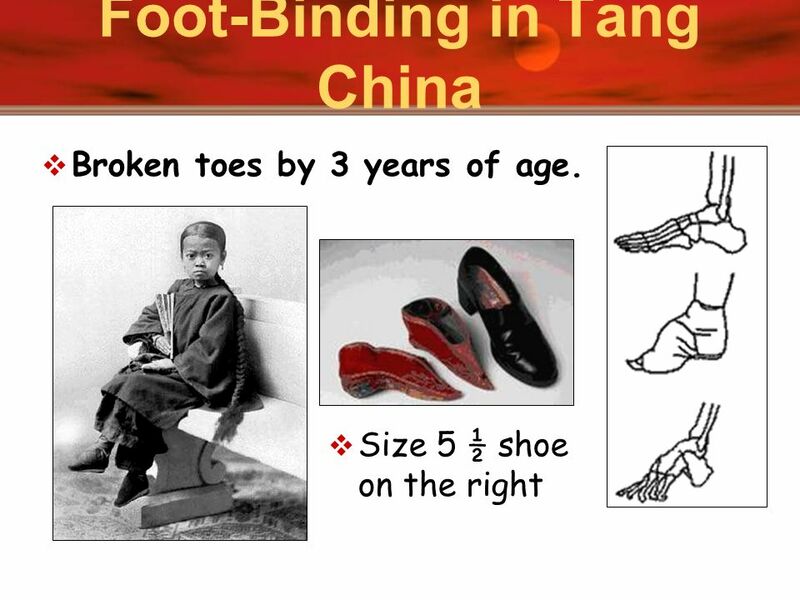 Mothers bound their daughters’ feet. The Han Synthesis term refers to the emphasis on Legalism, but with a touch of Confucianism. The Han dynasty recorded Confucius’s teachings (The Analects) and put a big emphasis on the family. Founded the Imperial University Required examinations to become bureaucrat (civil service system) Soldiers dropped to lowest status. Confucianists at work; Daoists at home. The Han tried to replace literature, including Confucius’s writings, lost during the Qin Dynasty. Created new works of literature and music. Scroll painting began during this time. Iron was now used for plows and weapons. Acupuncture was invented. Invented a crude seismic sensing tool, so they could send troops and food to the scene of an earthquake! Inventions include: paper (105 CE), sternpost rudder on ships, water mill, wheelbarrow, furrowed cultivation Show map for Silk Road trade. It brought Chinese together into one civilization, creating a common culture. 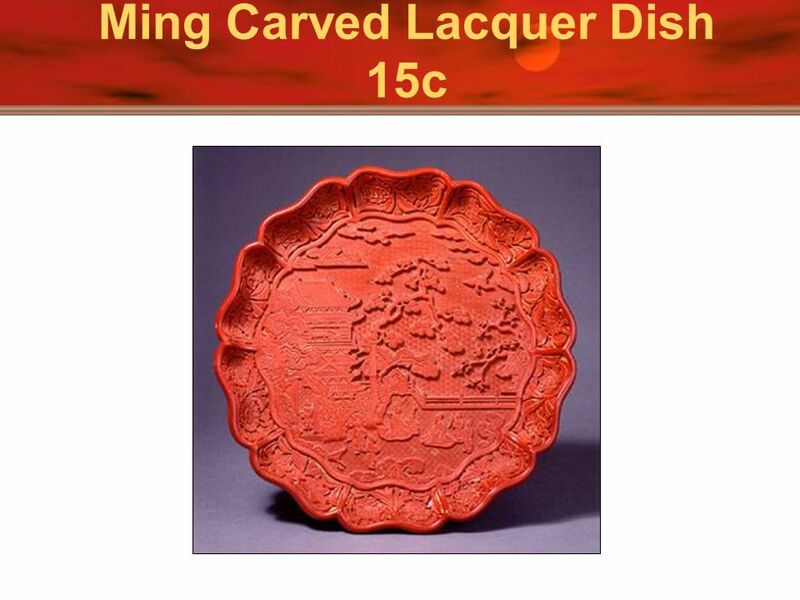 Economically, it brought much wealth to the Han, as they exported much more than they imported. Wudi’s public schools taught Confucianism. Grand School in capital. In 100 years, 30,000 studied there. For upper-class girls, it became a new custom. 38 Song [Sung] Dynasty, 960-1279 C.E. Creation of an urban, merchant, middle class. Increased emphasis on education & cheaper availability of printed books. 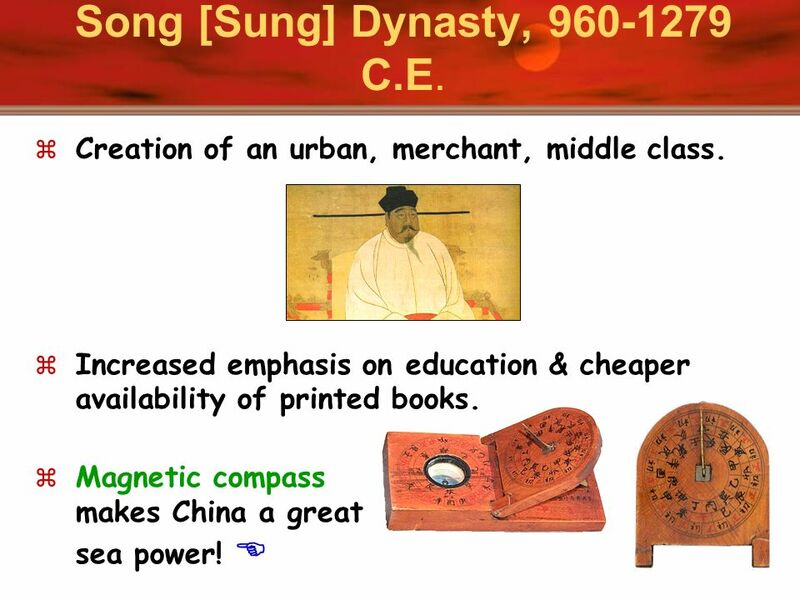 Magnetic compass makes China a great sea power! 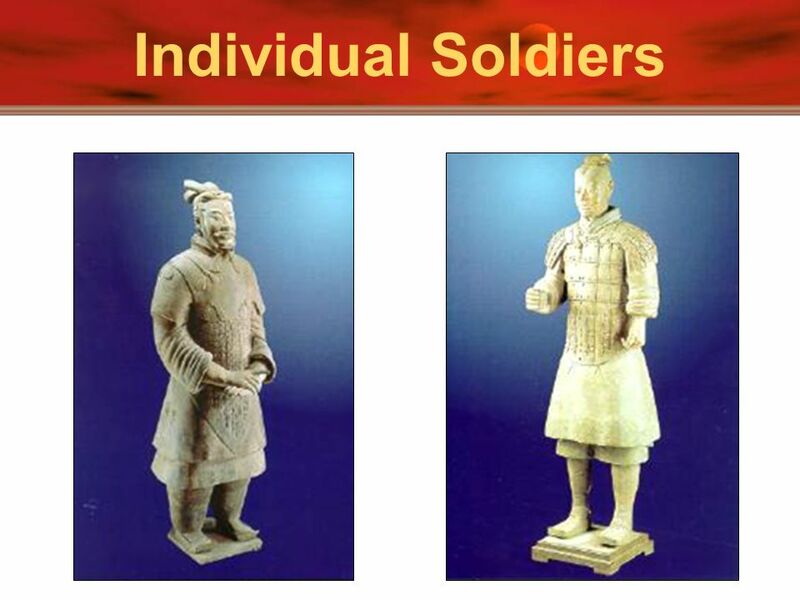  The Han Synthesis term refers to the emphasis on Legalism, but with a touch of Confucianism. The Han dynasty recorded Confucius’s teachings (The Analects) and put a big emphasis on the family. Founded the Imperial University Required examinations to become bureaucrat (civil service system) Soldiers dropped to lowest status. Confucianists at work; Daoists at home. The Han tried to replace literature, including Confucius’s writings, lost during the Qin Dynasty. Created new works of literature and music. Scroll painting began during this time. Iron was now used for plows and weapons. Acupuncture was invented. Invented a crude seismic sensing tool, so they could send troops and food to the scene of an earthquake! Inventions include: paper (105 CE), sternpost rudder on ships, water mill, wheelbarrow, furrowed cultivation Show map for Silk Road trade. It brought Chinese together into one civilization, creating a common culture. Economically, it brought much wealth to the Han, as they exported much more than they imported. Wudi’s public schools taught Confucianism. Grand School in capital. In 100 years, 30,000 studied there. 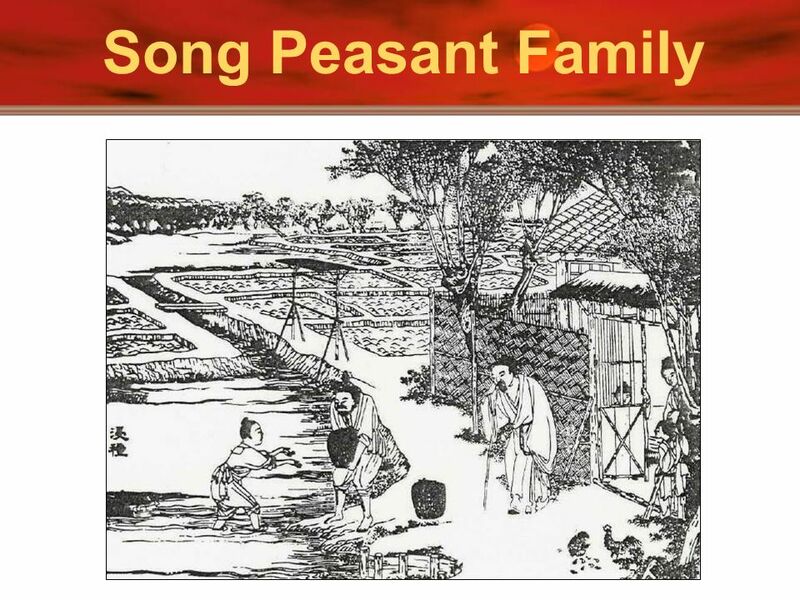 39 Song Peasant Family Above is a picture of Suzhou in Jiangsu province showing houses along the Grand Canal. From north to south, the Grand Canal is over 1,700 kilometers (roughly 1,100 miles) long, linking Hangzhou in Zhejiang province with Beijing in the north. An extremely important water project that was first started in the Sui dynasty ( ), it connects several big rivers and provides an important means of transportation and communication. With the two pictures below in mind, how do you think the access to rivers and lakes would have made the lifestyle of people in the south different from that of people in the north? Above is a picture of Suzhou in Jiangsu province showing houses along the Grand Canal. From north to south, the Grand Canal is over 1,700 kilometers (roughly 1,100 miles) long, linking Hangzhou in Zhejiang province with Beijing in the north. An extremely important water project that was first started in the Sui dynasty ( ), it connects several big rivers and provides an important means of transportation and communication. With the two pictures below in mind, how do you think the access to rivers and lakes would have made the lifestyle of people in the south different from that of people in the north? 41 Song Rice Cultivation Above is a picture of Suzhou in Jiangsu province showing houses along the Grand Canal. From north to south, the Grand Canal is over 1,700 kilometers (roughly 1,100 miles) long, linking Hangzhou in Zhejiang province with Beijing in the north. An extremely important water project that was first started in the Sui dynasty ( ), it connects several big rivers and provides an important means of transportation and communication. With the two pictures below in mind, how do you think the access to rivers and lakes would have made the lifestyle of people in the south different from that of people in the north? 42 Above is a picture of Suzhou in Jiangsu province showing houses along the Grand Canal. From north to south, the Grand Canal is over 1,700 kilometers (roughly 1,100 miles) long, linking Hangzhou in Zhejiang province with Beijing in the north. An extremely important water project that was first started in the Sui dynasty ( ), it connects several big rivers and provides an important means of transportation and communication. With the two pictures below in mind, how do you think the access to rivers and lakes would have made the lifestyle of people in the south different from that of people in the north? 45 Mongol Invasions Above is a picture of Suzhou in Jiangsu province showing houses along the Grand Canal. From north to south, the Grand Canal is over 1,700 kilometers (roughly 1,100 miles) long, linking Hangzhou in Zhejiang province with Beijing in the north. An extremely important water project that was first started in the Sui dynasty ( ), it connects several big rivers and provides an important means of transportation and communication. With the two pictures below in mind, how do you think the access to rivers and lakes would have made the lifestyle of people in the south different from that of people in the north? 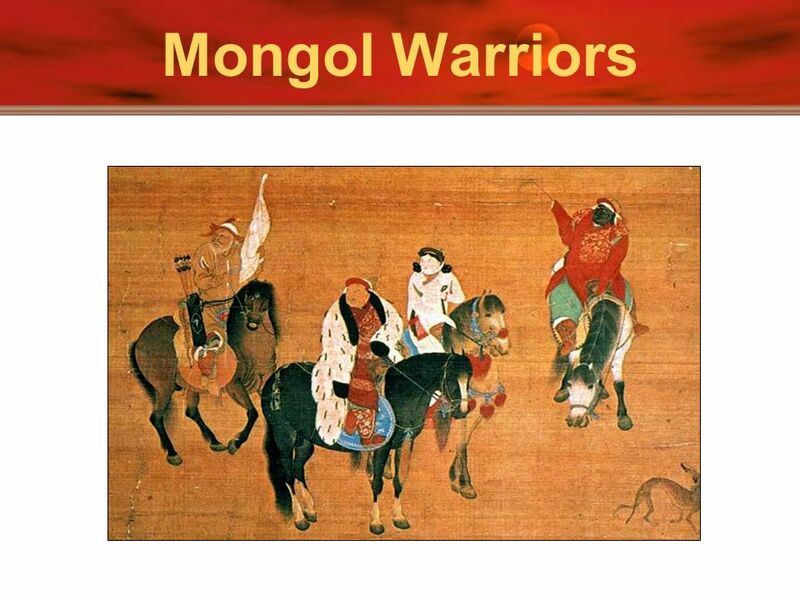 46 Mongol Warriors The Han Synthesis term refers to the emphasis on Legalism, but with a touch of Confucianism. The Han dynasty recorded Confucius’s teachings (The Analects) and put a big emphasis on the family. Founded the Imperial University Required examinations to become bureaucrat (civil service system) Soldiers dropped to lowest status. Confucianists at work; Daoists at home. The Han tried to replace literature, including Confucius’s writings, lost during the Qin Dynasty. Created new works of literature and music. Scroll painting began during this time. Iron was now used for plows and weapons. Acupuncture was invented. Invented a crude seismic sensing tool, so they could send troops and food to the scene of an earthquake! Inventions include: paper (105 CE), sternpost rudder on ships, water mill, wheelbarrow, furrowed cultivation Show map for Silk Road trade. It brought Chinese together into one civilization, creating a common culture. Economically, it brought much wealth to the Han, as they exported much more than they imported. Wudi’s public schools taught Confucianism. Grand School in capital. In 100 years, 30,000 studied there. 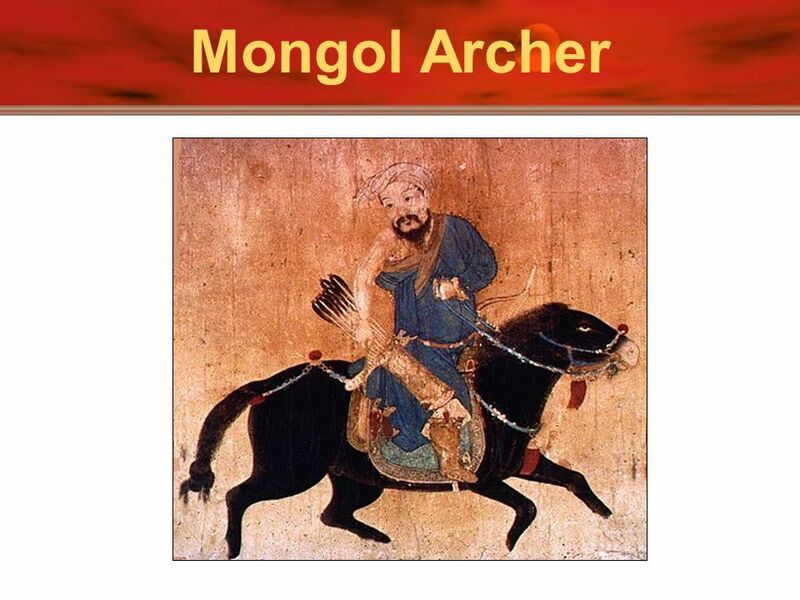 47 Mongol Archer The Han Synthesis term refers to the emphasis on Legalism, but with a touch of Confucianism. The Han dynasty recorded Confucius’s teachings (The Analects) and put a big emphasis on the family. Founded the Imperial University Required examinations to become bureaucrat (civil service system) Soldiers dropped to lowest status. Confucianists at work; Daoists at home. The Han tried to replace literature, including Confucius’s writings, lost during the Qin Dynasty. Created new works of literature and music. Scroll painting began during this time. Iron was now used for plows and weapons. Acupuncture was invented. Invented a crude seismic sensing tool, so they could send troops and food to the scene of an earthquake! Inventions include: paper (105 CE), sternpost rudder on ships, water mill, wheelbarrow, furrowed cultivation Show map for Silk Road trade. It brought Chinese together into one civilization, creating a common culture. Economically, it brought much wealth to the Han, as they exported much more than they imported. Wudi’s public schools taught Confucianism. Grand School in capital. In 100 years, 30,000 studied there. 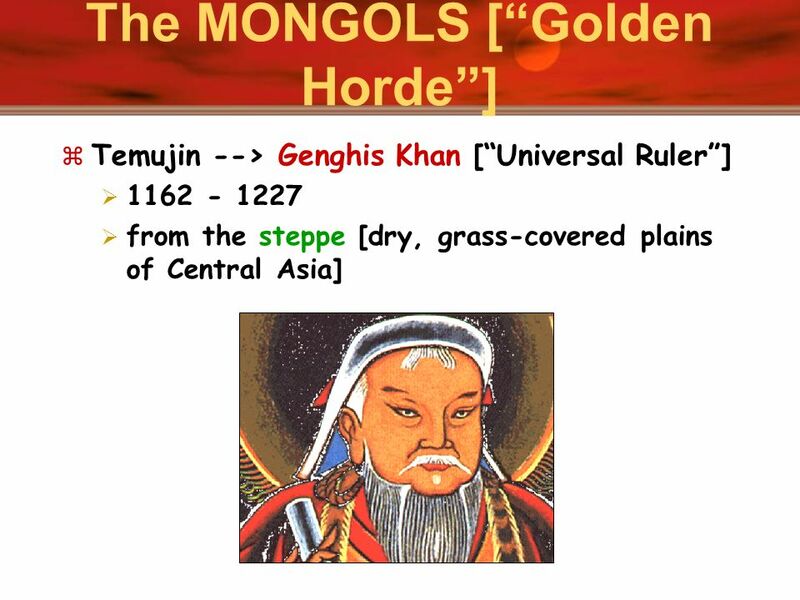 Temujin --> Genghis Khan [“Universal Ruler”] from the steppe [dry, grass-covered plains of Central Asia] The Han Synthesis term refers to the emphasis on Legalism, but with a touch of Confucianism. The Han dynasty recorded Confucius’s teachings (The Analects) and put a big emphasis on the family. Founded the Imperial University Required examinations to become bureaucrat (civil service system) Soldiers dropped to lowest status. Confucianists at work; Daoists at home. The Han tried to replace literature, including Confucius’s writings, lost during the Qin Dynasty. Created new works of literature and music. Scroll painting began during this time. Iron was now used for plows and weapons. Acupuncture was invented. Invented a crude seismic sensing tool, so they could send troops and food to the scene of an earthquake! Inventions include: paper (105 CE), sternpost rudder on ships, water mill, wheelbarrow, furrowed cultivation Show map for Silk Road trade. It brought Chinese together into one civilization, creating a common culture. Economically, it brought much wealth to the Han, as they exported much more than they imported. Wudi’s public schools taught Confucianism. Grand School in capital. In 100 years, 30,000 studied there. 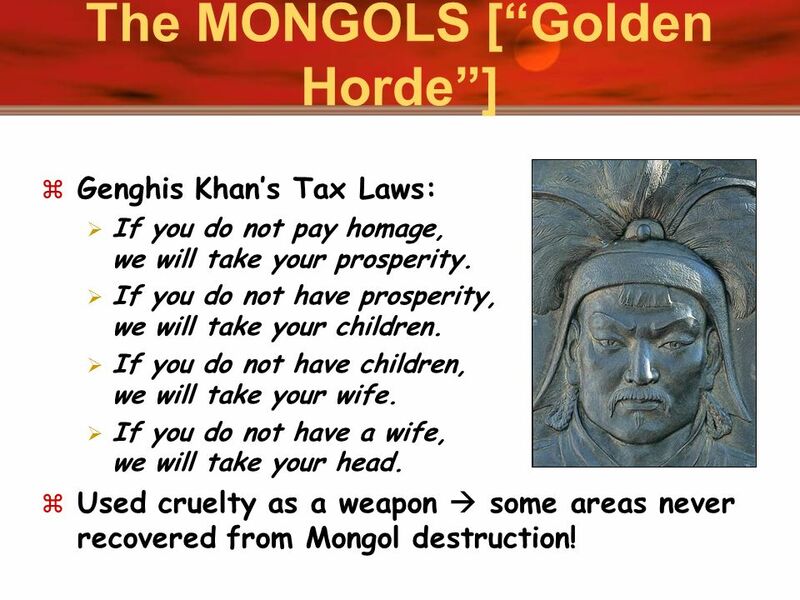 Genghis Khan’s Tax Laws: If you do not pay homage, we will take your prosperity. If you do not have prosperity, we will take your children. If you do not have children, we will take your wife. If you do not have a wife, we will take your head. 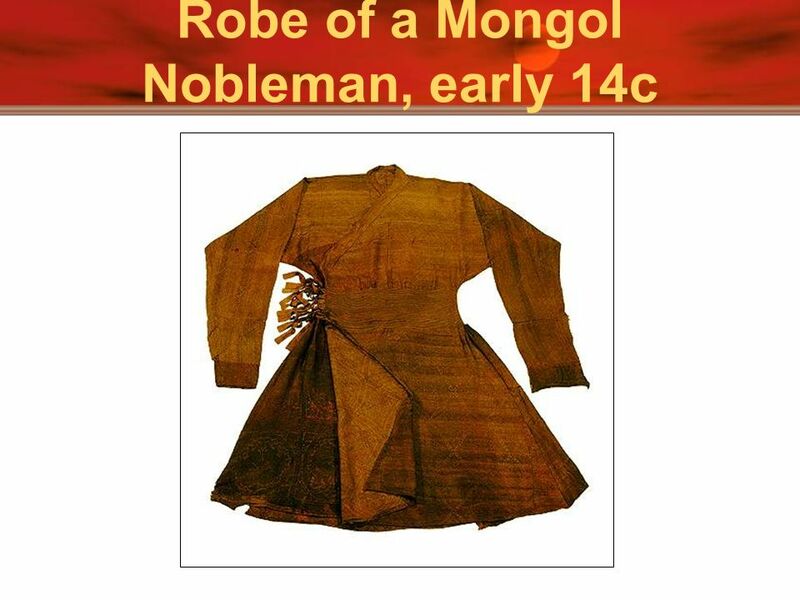 Used cruelty as a weapon  some areas never recovered from Mongol destruction! The Han Synthesis term refers to the emphasis on Legalism, but with a touch of Confucianism. The Han dynasty recorded Confucius’s teachings (The Analects) and put a big emphasis on the family. Founded the Imperial University Required examinations to become bureaucrat (civil service system) Soldiers dropped to lowest status. Confucianists at work; Daoists at home. The Han tried to replace literature, including Confucius’s writings, lost during the Qin Dynasty. Created new works of literature and music. Scroll painting began during this time. Iron was now used for plows and weapons. Acupuncture was invented. Invented a crude seismic sensing tool, so they could send troops and food to the scene of an earthquake! Inventions include: paper (105 CE), sternpost rudder on ships, water mill, wheelbarrow, furrowed cultivation Show map for Silk Road trade. It brought Chinese together into one civilization, creating a common culture. 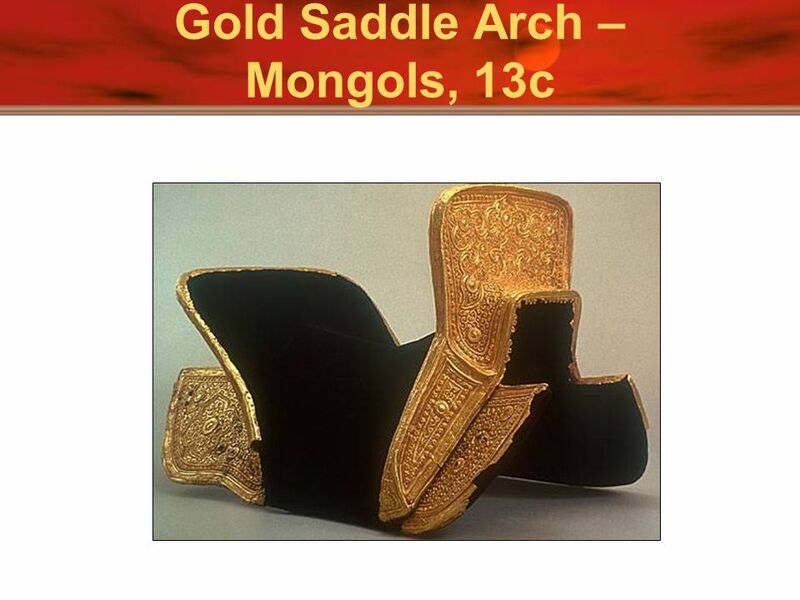 Economically, it brought much wealth to the Han, as they exported much more than they imported. Wudi’s public schools taught Confucianism. Grand School in capital. In 100 years, 30,000 studied there. 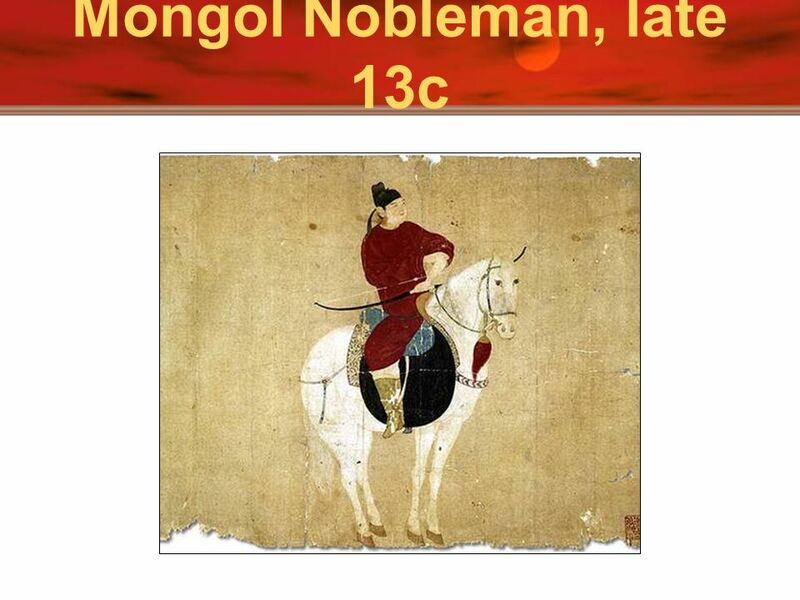 52 Mongol Nobleman, late 13c Above is a picture of Suzhou in Jiangsu province showing houses along the Grand Canal. 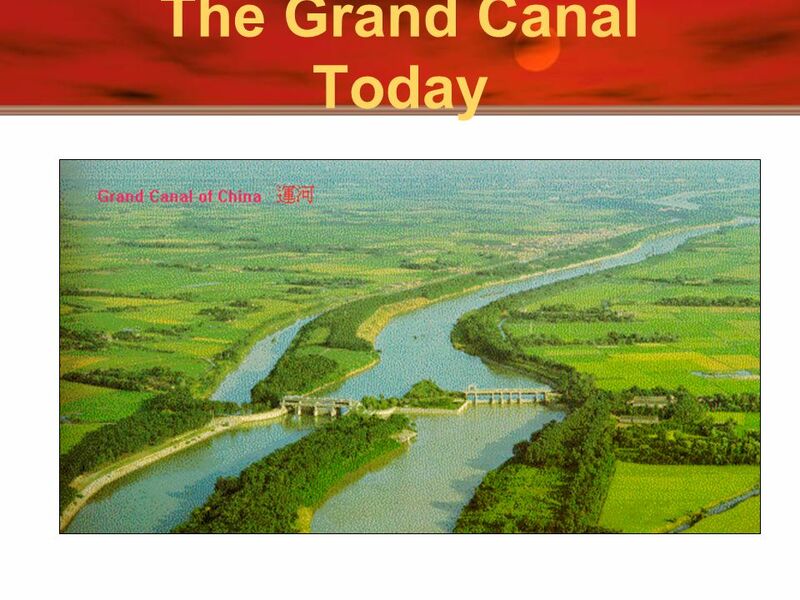 From north to south, the Grand Canal is over 1,700 kilometers (roughly 1,100 miles) long, linking Hangzhou in Zhejiang province with Beijing in the north. 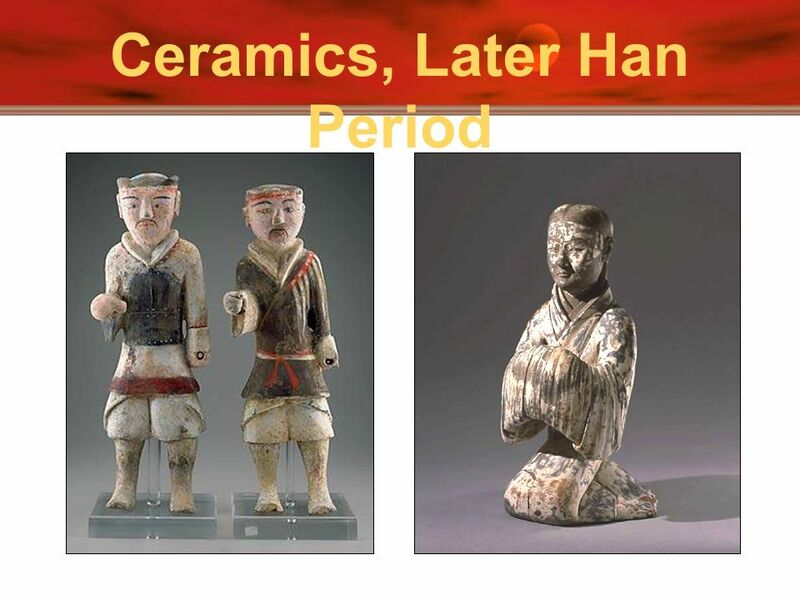 An extremely important water project that was first started in the Sui dynasty ( ), it connects several big rivers and provides an important means of transportation and communication. With the two pictures below in mind, how do you think the access to rivers and lakes would have made the lifestyle of people in the south different from that of people in the north? 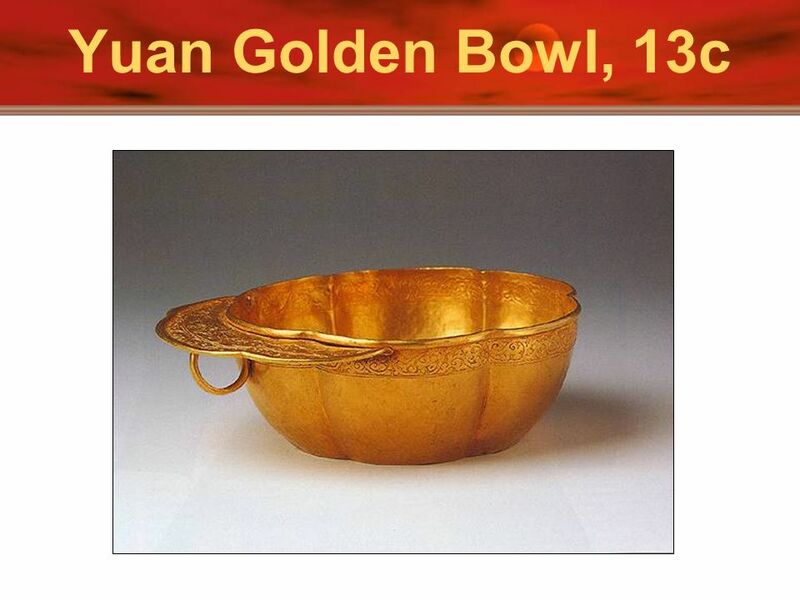 54 Yuan Golden Bowl, 13c Above is a picture of Suzhou in Jiangsu province showing houses along the Grand Canal. From north to south, the Grand Canal is over 1,700 kilometers (roughly 1,100 miles) long, linking Hangzhou in Zhejiang province with Beijing in the north. 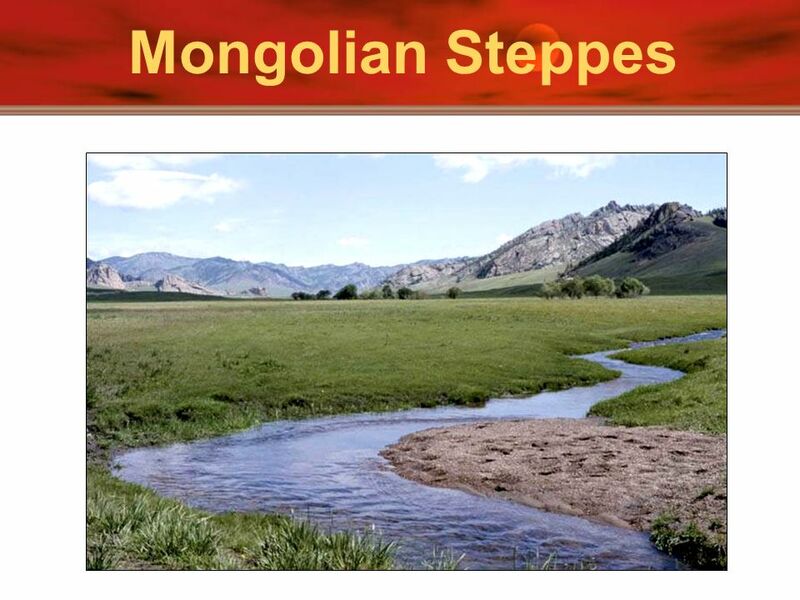 An extremely important water project that was first started in the Sui dynasty ( ), it connects several big rivers and provides an important means of transportation and communication. With the two pictures below in mind, how do you think the access to rivers and lakes would have made the lifestyle of people in the south different from that of people in the north? 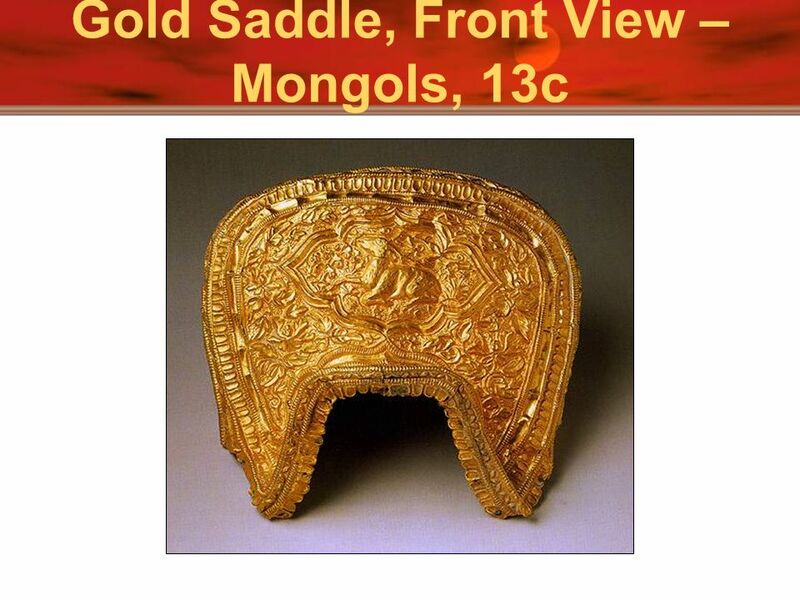 56 Yuan (Mongol) Dynasty, 1279-1368 C.E. 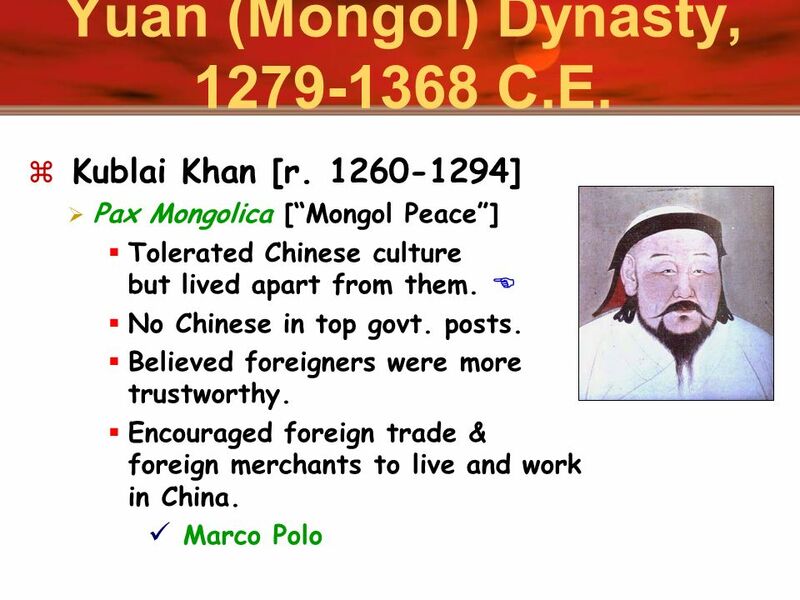 Kublai Khan [r ] Pax Mongolica [“Mongol Peace”] Tolerated Chinese culture but lived apart from them.  No Chinese in top govt. posts. Believed foreigners were more trustworthy. Encouraged foreign trade & foreign merchants to live and work in China. Marco Polo The Han Synthesis term refers to the emphasis on Legalism, but with a touch of Confucianism. The Han dynasty recorded Confucius’s teachings (The Analects) and put a big emphasis on the family. Founded the Imperial University Required examinations to become bureaucrat (civil service system) Soldiers dropped to lowest status. Confucianists at work; Daoists at home. 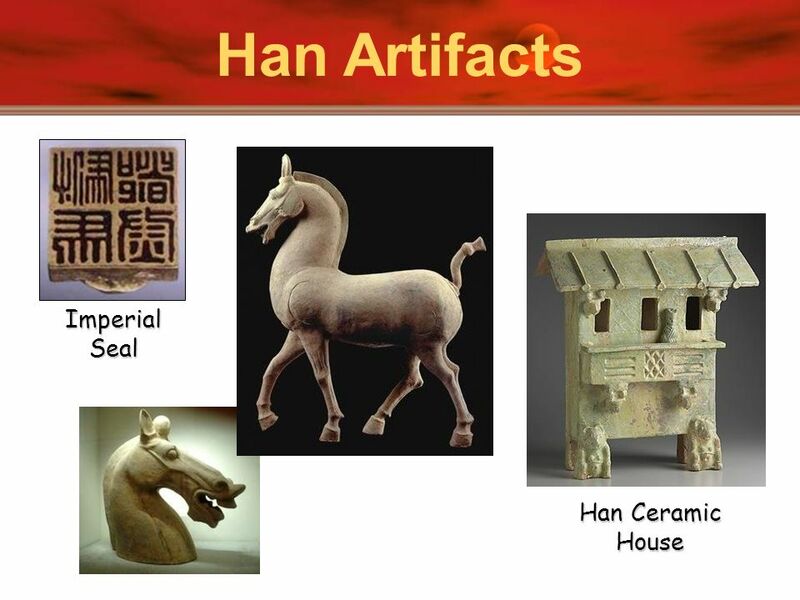 The Han tried to replace literature, including Confucius’s writings, lost during the Qin Dynasty. Created new works of literature and music. Scroll painting began during this time. Iron was now used for plows and weapons. Acupuncture was invented. Invented a crude seismic sensing tool, so they could send troops and food to the scene of an earthquake! Inventions include: paper (105 CE), sternpost rudder on ships, water mill, wheelbarrow, furrowed cultivation Show map for Silk Road trade. It brought Chinese together into one civilization, creating a common culture. 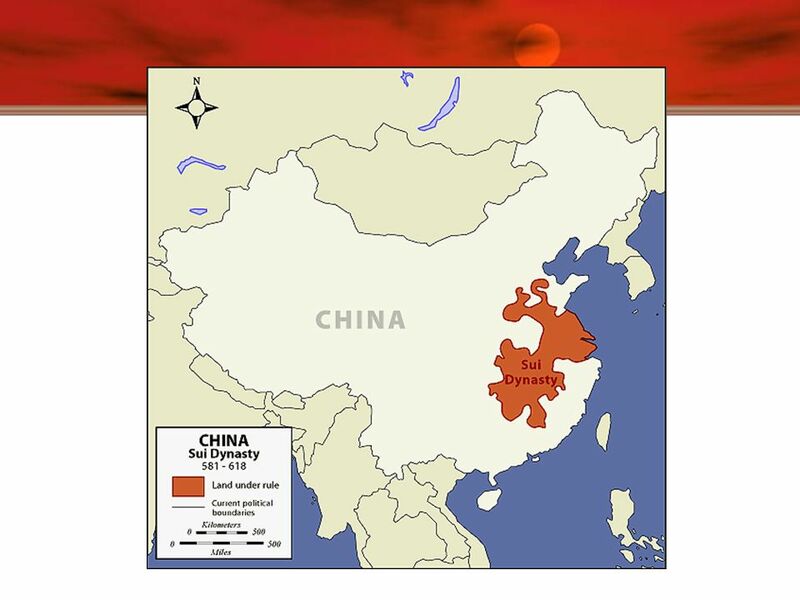 Economically, it brought much wealth to the Han, as they exported much more than they imported. Wudi’s public schools taught Confucianism. Grand School in capital. In 100 years, 30,000 studied there. 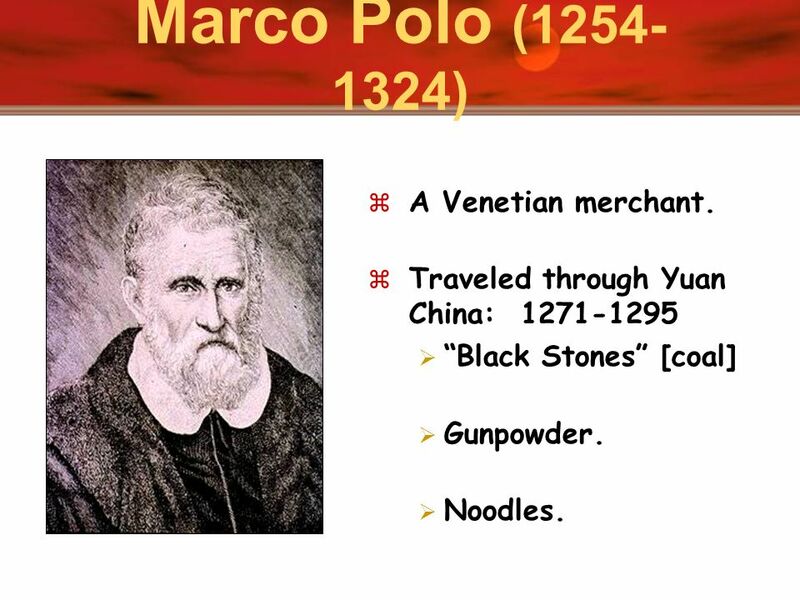 57 Marco Polo (1254-1324) A Venetian merchant. Traveled through Yuan China: “Black Stones” [coal] Gunpowder. Noodles. The Han Synthesis term refers to the emphasis on Legalism, but with a touch of Confucianism. The Han dynasty recorded Confucius’s teachings (The Analects) and put a big emphasis on the family. Founded the Imperial University Required examinations to become bureaucrat (civil service system) Soldiers dropped to lowest status. Confucianists at work; Daoists at home. The Han tried to replace literature, including Confucius’s writings, lost during the Qin Dynasty. Created new works of literature and music. Scroll painting began during this time. Iron was now used for plows and weapons. Acupuncture was invented. Invented a crude seismic sensing tool, so they could send troops and food to the scene of an earthquake! Inventions include: paper (105 CE), sternpost rudder on ships, water mill, wheelbarrow, furrowed cultivation Show map for Silk Road trade. It brought Chinese together into one civilization, creating a common culture. Economically, it brought much wealth to the Han, as they exported much more than they imported. Wudi’s public schools taught Confucianism. Grand School in capital. In 100 years, 30,000 studied there. 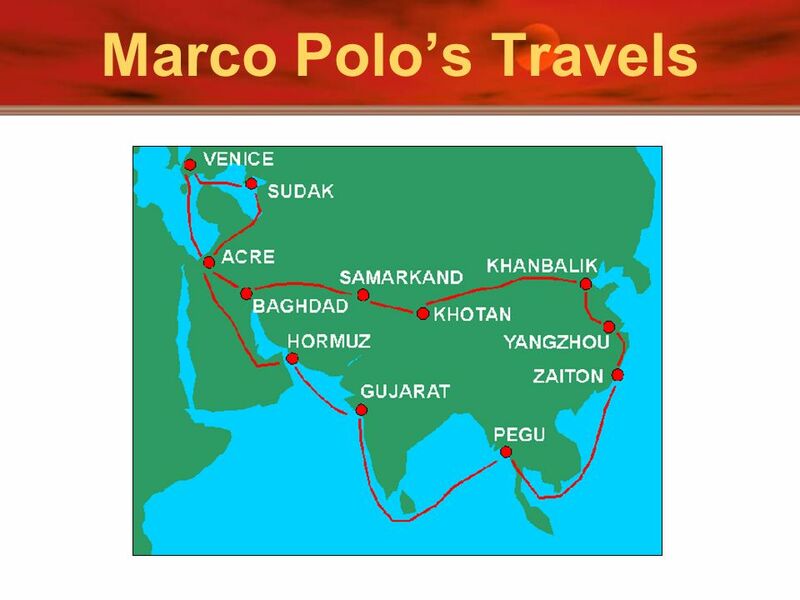 58 Marco Polo’s Travels The Han Synthesis term refers to the emphasis on Legalism, but with a touch of Confucianism. The Han dynasty recorded Confucius’s teachings (The Analects) and put a big emphasis on the family. Founded the Imperial University Required examinations to become bureaucrat (civil service system) Soldiers dropped to lowest status. Confucianists at work; Daoists at home. The Han tried to replace literature, including Confucius’s writings, lost during the Qin Dynasty. Created new works of literature and music. Scroll painting began during this time. Iron was now used for plows and weapons. Acupuncture was invented. Invented a crude seismic sensing tool, so they could send troops and food to the scene of an earthquake! Inventions include: paper (105 CE), sternpost rudder on ships, water mill, wheelbarrow, furrowed cultivation Show map for Silk Road trade. 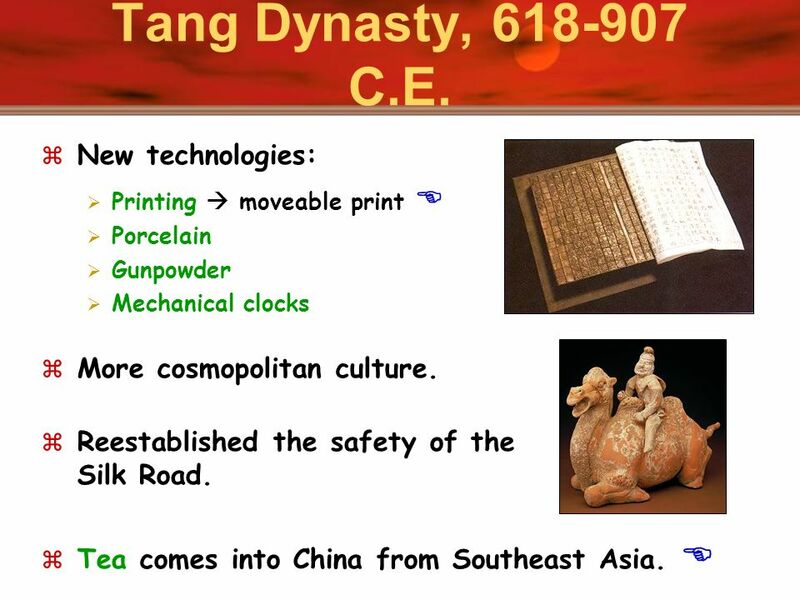 It brought Chinese together into one civilization, creating a common culture. Economically, it brought much wealth to the Han, as they exported much more than they imported. Wudi’s public schools taught Confucianism. Grand School in capital. In 100 years, 30,000 studied there. 60 Yuan Dynasty, C.E. 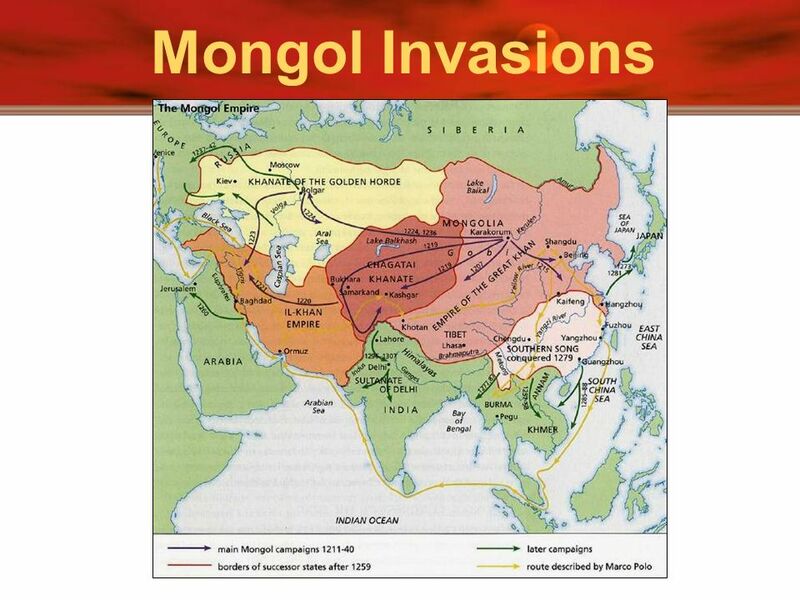 The Black Plague was spread by the Mongols in the mid-14c. Sent fleets against Japan. 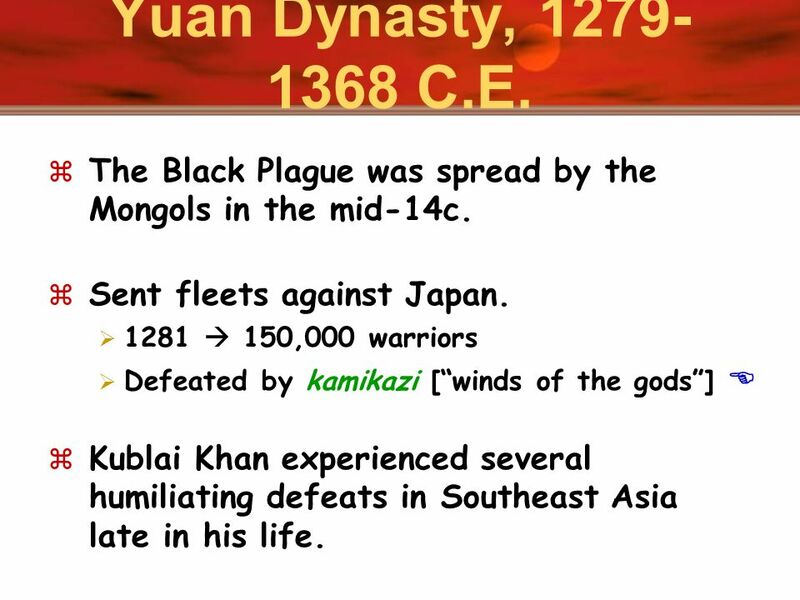 1281  150,000 warriors Defeated by kamikazi [“winds of the gods”]  Kublai Khan experienced several humiliating defeats in Southeast Asia late in his life. The Han Synthesis term refers to the emphasis on Legalism, but with a touch of Confucianism. The Han dynasty recorded Confucius’s teachings (The Analects) and put a big emphasis on the family. Founded the Imperial University Required examinations to become bureaucrat (civil service system) Soldiers dropped to lowest status. Confucianists at work; Daoists at home. The Han tried to replace literature, including Confucius’s writings, lost during the Qin Dynasty. Created new works of literature and music. Scroll painting began during this time. Iron was now used for plows and weapons. Acupuncture was invented. Invented a crude seismic sensing tool, so they could send troops and food to the scene of an earthquake! Inventions include: paper (105 CE), sternpost rudder on ships, water mill, wheelbarrow, furrowed cultivation Show map for Silk Road trade. It brought Chinese together into one civilization, creating a common culture. Economically, it brought much wealth to the Han, as they exported much more than they imported. Wudi’s public schools taught Confucianism. Grand School in capital. In 100 years, 30,000 studied there. 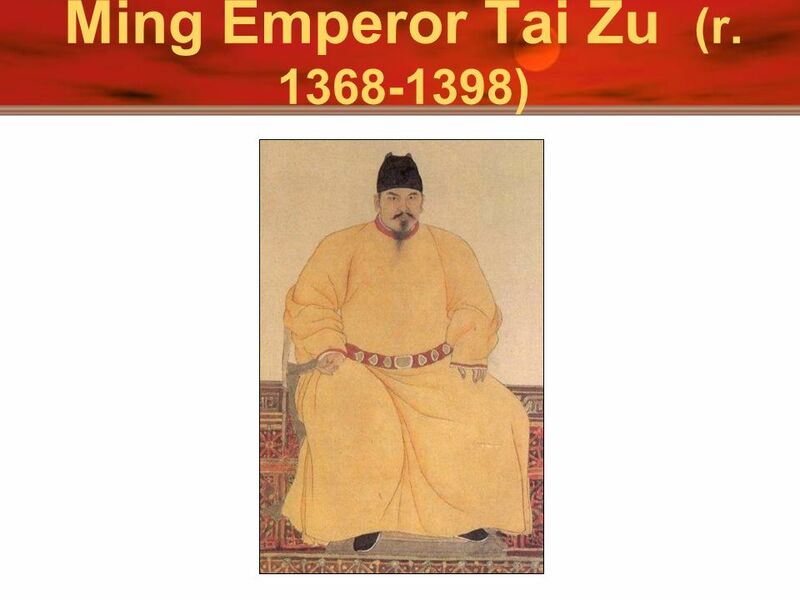 61 China’s last native imperial dynasty! 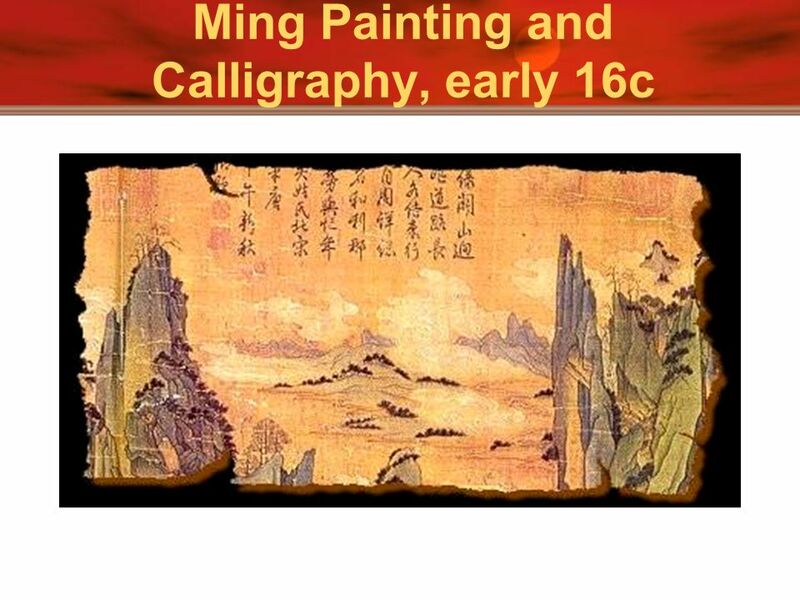 Printing & Literacy Cheap, popular books: woodblock printing. cheap paper. Examination system. Leads to explosion in literacy.  Leads to further popularization of the commercial market. 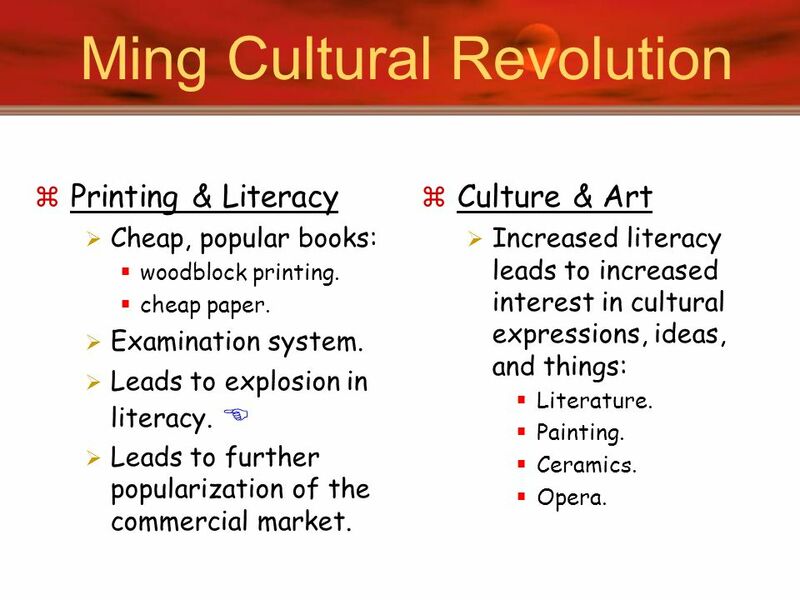 Culture & Art Increased literacy leads to increased interest in cultural expressions, ideas, and things: Literature. Painting. Ceramics. Opera. Philippines to China to Japan. 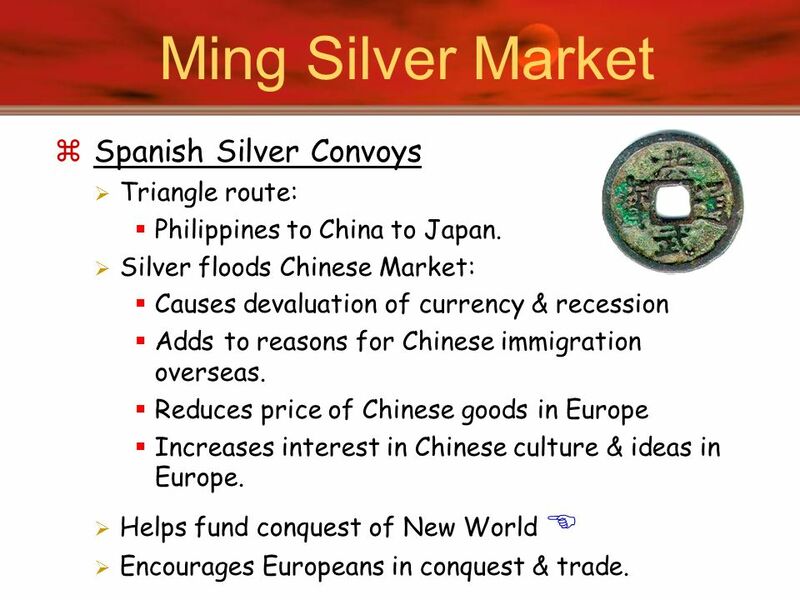 Silver floods Chinese Market: Causes devaluation of currency & recession Adds to reasons for Chinese immigration overseas. 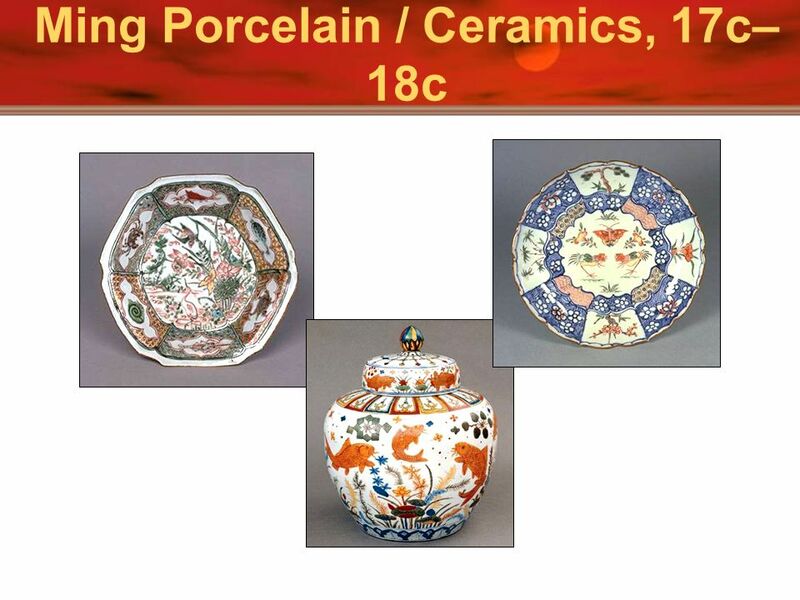 Reduces price of Chinese goods in Europe Increases interest in Chinese culture & ideas in Europe. Helps fund conquest of New World  Encourages Europeans in conquest & trade. Softness Gracefulness Three different schools of painting developed. 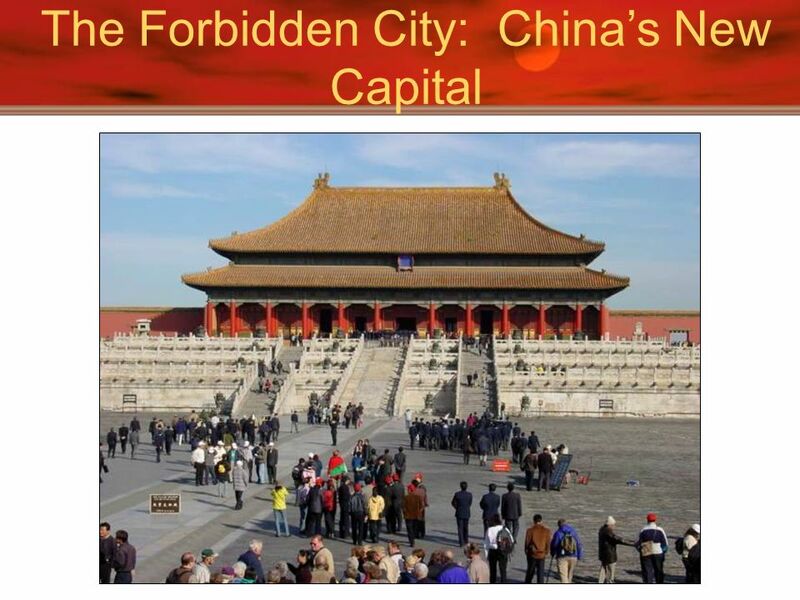 Hundreds of thousands of workers constructed the Forbidden City. The Han Synthesis term refers to the emphasis on Legalism, but with a touch of Confucianism. The Han dynasty recorded Confucius’s teachings (The Analects) and put a big emphasis on the family. Founded the Imperial University Required examinations to become bureaucrat (civil service system) Soldiers dropped to lowest status. Confucianists at work; Daoists at home. The Han tried to replace literature, including Confucius’s writings, lost during the Qin Dynasty. Created new works of literature and music. Scroll painting began during this time. Iron was now used for plows and weapons. Acupuncture was invented. Invented a crude seismic sensing tool, so they could send troops and food to the scene of an earthquake! Inventions include: paper (105 CE), sternpost rudder on ships, water mill, wheelbarrow, furrowed cultivation Show map for Silk Road trade. It brought Chinese together into one civilization, creating a common culture. Economically, it brought much wealth to the Han, as they exported much more than they imported. 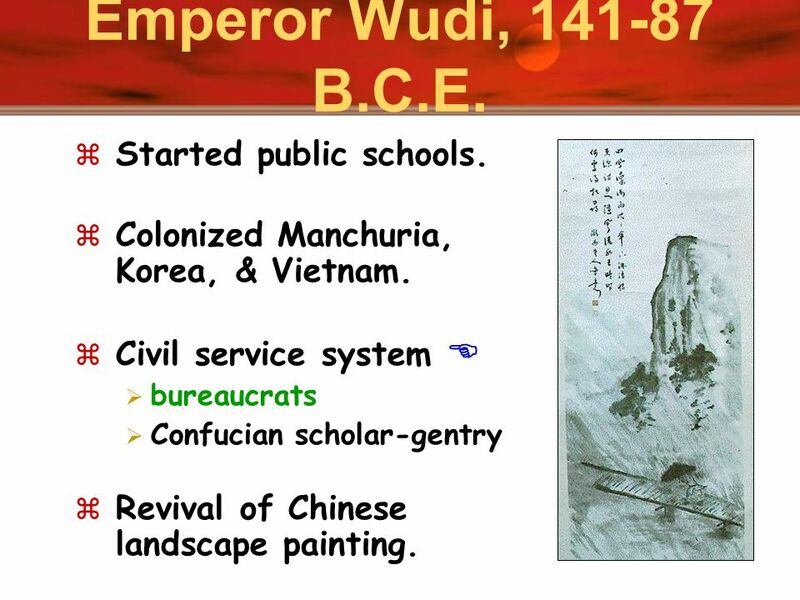 Wudi’s public schools taught Confucianism. Grand School in capital. In 100 years, 30,000 studied there. 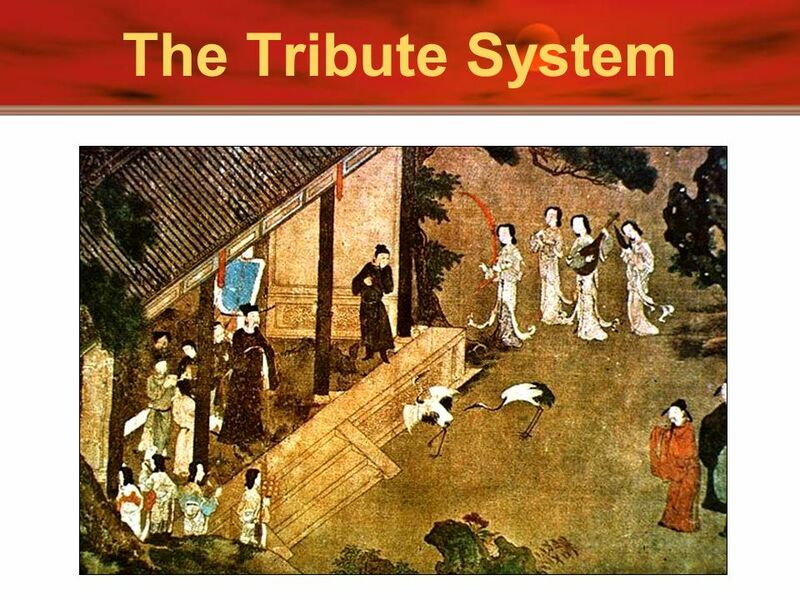 68 The Tribute System The Han Synthesis term refers to the emphasis on Legalism, but with a touch of Confucianism. The Han dynasty recorded Confucius’s teachings (The Analects) and put a big emphasis on the family. Founded the Imperial University Required examinations to become bureaucrat (civil service system) Soldiers dropped to lowest status. Confucianists at work; Daoists at home. The Han tried to replace literature, including Confucius’s writings, lost during the Qin Dynasty. Created new works of literature and music. Scroll painting began during this time. Iron was now used for plows and weapons. Acupuncture was invented. Invented a crude seismic sensing tool, so they could send troops and food to the scene of an earthquake! Inventions include: paper (105 CE), sternpost rudder on ships, water mill, wheelbarrow, furrowed cultivation Show map for Silk Road trade. It brought Chinese together into one civilization, creating a common culture. Economically, it brought much wealth to the Han, as they exported much more than they imported. Wudi’s public schools taught Confucianism. Grand School in capital. In 100 years, 30,000 studied there. 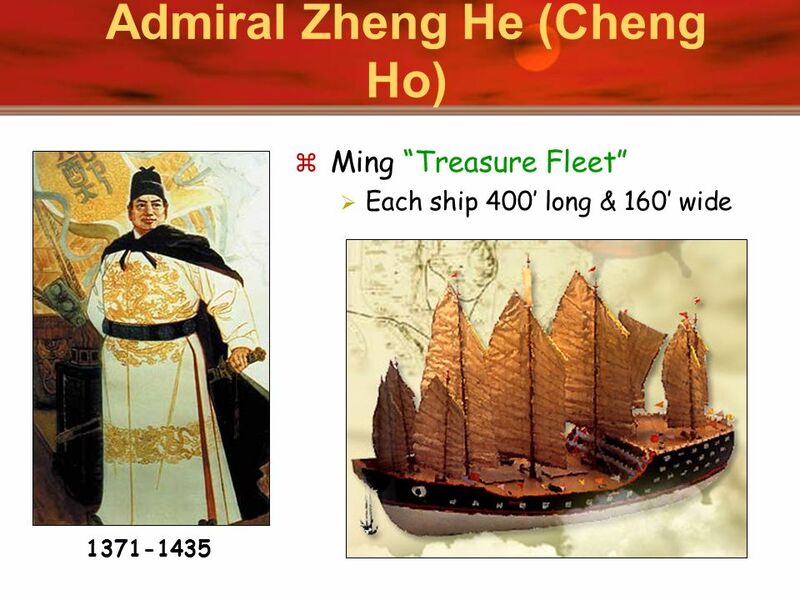 Ming “Treasure Fleet” Each ship 400’ long & 160’ wide The Han Synthesis term refers to the emphasis on Legalism, but with a touch of Confucianism. The Han dynasty recorded Confucius’s teachings (The Analects) and put a big emphasis on the family. Founded the Imperial University Required examinations to become bureaucrat (civil service system) Soldiers dropped to lowest status. Confucianists at work; Daoists at home. The Han tried to replace literature, including Confucius’s writings, lost during the Qin Dynasty. Created new works of literature and music. Scroll painting began during this time. Iron was now used for plows and weapons. Acupuncture was invented. Invented a crude seismic sensing tool, so they could send troops and food to the scene of an earthquake! Inventions include: paper (105 CE), sternpost rudder on ships, water mill, wheelbarrow, furrowed cultivation Show map for Silk Road trade. It brought Chinese together into one civilization, creating a common culture. Economically, it brought much wealth to the Han, as they exported much more than they imported. Wudi’s public schools taught Confucianism. Grand School in capital. In 100 years, 30,000 studied there. First Voyage: [62 ships; 27,800 men]. Second Voyage: [Ho didn’t go on this trip]. Third Voyage: [48 ships; 30,000 men]. Fourth Voyage: [63 ships; 28,500 men]. 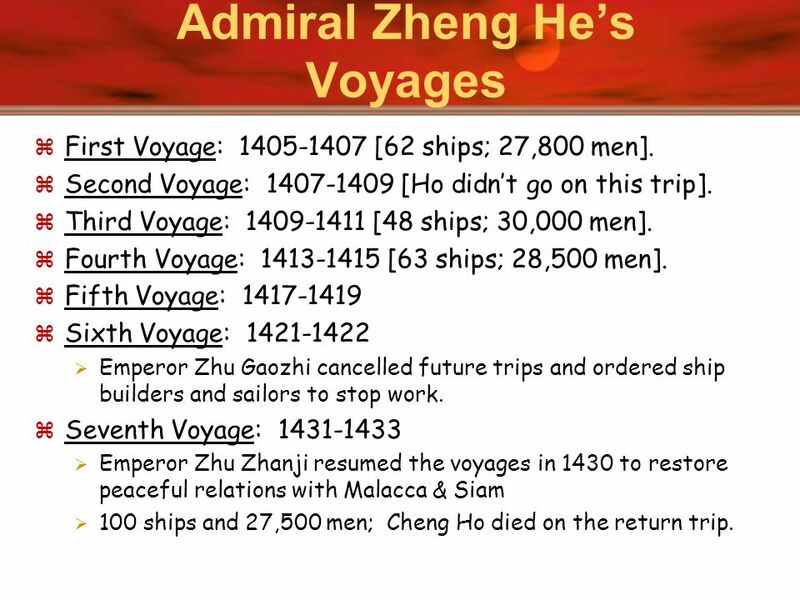 Fifth Voyage: Sixth Voyage: Emperor Zhu Gaozhi cancelled future trips and ordered ship builders and sailors to stop work. 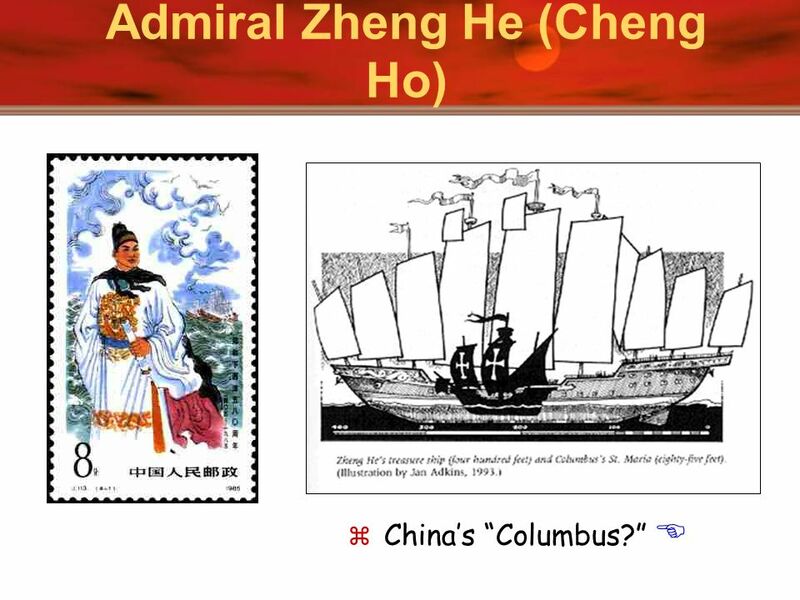 Seventh Voyage: Emperor Zhu Zhanji resumed the voyages in 1430 to restore peaceful relations with Malacca & Siam 100 ships and 27,500 men; Cheng Ho died on the return trip. The Han Synthesis term refers to the emphasis on Legalism, but with a touch of Confucianism. The Han dynasty recorded Confucius’s teachings (The Analects) and put a big emphasis on the family. Founded the Imperial University Required examinations to become bureaucrat (civil service system) Soldiers dropped to lowest status. Confucianists at work; Daoists at home. The Han tried to replace literature, including Confucius’s writings, lost during the Qin Dynasty. Created new works of literature and music. Scroll painting began during this time. Iron was now used for plows and weapons. Acupuncture was invented. Invented a crude seismic sensing tool, so they could send troops and food to the scene of an earthquake! Inventions include: paper (105 CE), sternpost rudder on ships, water mill, wheelbarrow, furrowed cultivation Show map for Silk Road trade. It brought Chinese together into one civilization, creating a common culture. Economically, it brought much wealth to the Han, as they exported much more than they imported. Wudi’s public schools taught Confucianism. Grand School in capital. In 100 years, 30,000 studied there. 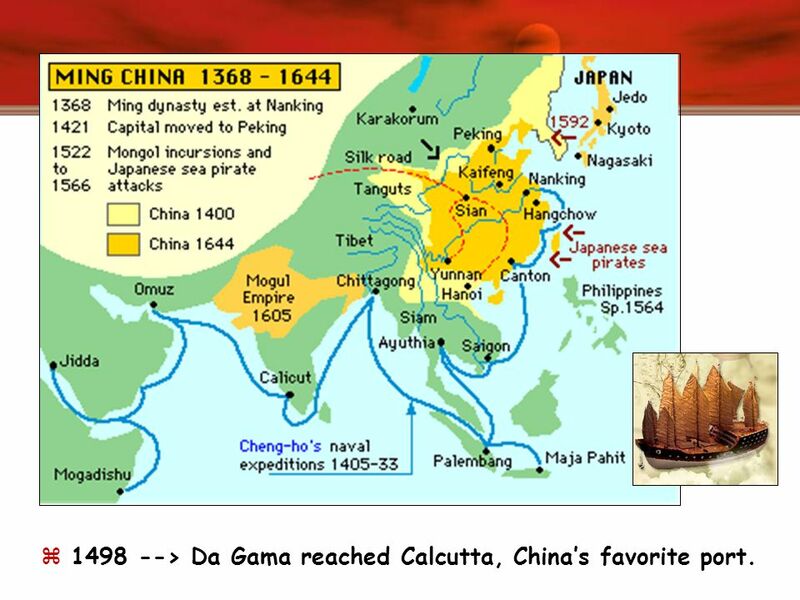 72 1498 --> Da Gama reached Calcutta, China’s favorite port. The Han Synthesis term refers to the emphasis on Legalism, but with a touch of Confucianism. The Han dynasty recorded Confucius’s teachings (The Analects) and put a big emphasis on the family. Founded the Imperial University Required examinations to become bureaucrat (civil service system) Soldiers dropped to lowest status. Confucianists at work; Daoists at home. The Han tried to replace literature, including Confucius’s writings, lost during the Qin Dynasty. Created new works of literature and music. Scroll painting began during this time. Iron was now used for plows and weapons. Acupuncture was invented. Invented a crude seismic sensing tool, so they could send troops and food to the scene of an earthquake! Inventions include: paper (105 CE), sternpost rudder on ships, water mill, wheelbarrow, furrowed cultivation Show map for Silk Road trade. It brought Chinese together into one civilization, creating a common culture. Economically, it brought much wealth to the Han, as they exported much more than they imported. Wudi’s public schools taught Confucianism. Grand School in capital. In 100 years, 30,000 studied there. > Da Gama reached Calcutta, China’s favorite port. 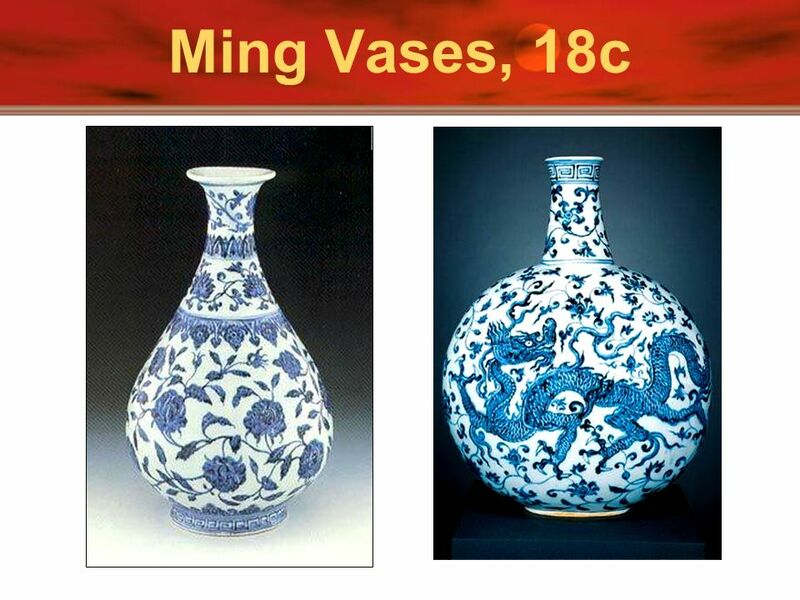 74 Ming Vases, 18c Above is a picture of Suzhou in Jiangsu province showing houses along the Grand Canal. From north to south, the Grand Canal is over 1,700 kilometers (roughly 1,100 miles) long, linking Hangzhou in Zhejiang province with Beijing in the north. An extremely important water project that was first started in the Sui dynasty ( ), it connects several big rivers and provides an important means of transportation and communication. With the two pictures below in mind, how do you think the access to rivers and lakes would have made the lifestyle of people in the south different from that of people in the north? Removed religion from morality. Beginnings of political philosophy through which a ruler must prove he/she is legitimate. Mandate of Heaven Secular law. 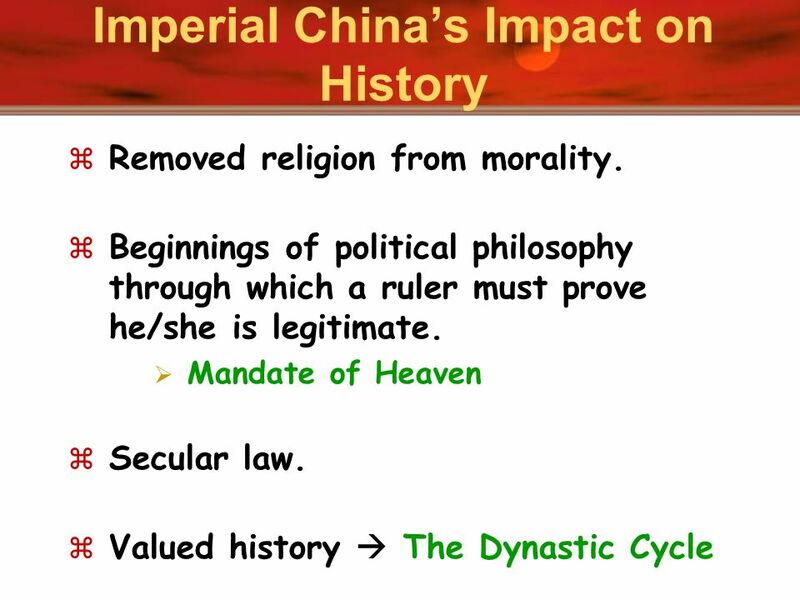 Valued history  The Dynastic Cycle The Han Synthesis term refers to the emphasis on Legalism, but with a touch of Confucianism. The Han dynasty recorded Confucius’s teachings (The Analects) and put a big emphasis on the family. Founded the Imperial University Required examinations to become bureaucrat (civil service system) Soldiers dropped to lowest status. Confucianists at work; Daoists at home. The Han tried to replace literature, including Confucius’s writings, lost during the Qin Dynasty. Created new works of literature and music. 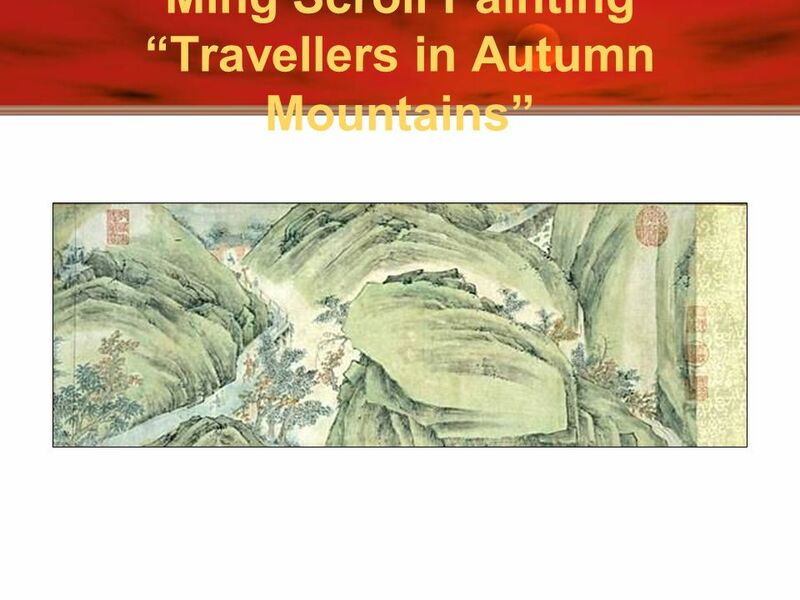 Scroll painting began during this time. Iron was now used for plows and weapons. Acupuncture was invented. Invented a crude seismic sensing tool, so they could send troops and food to the scene of an earthquake! Inventions include: paper (105 CE), sternpost rudder on ships, water mill, wheelbarrow, furrowed cultivation Show map for Silk Road trade. 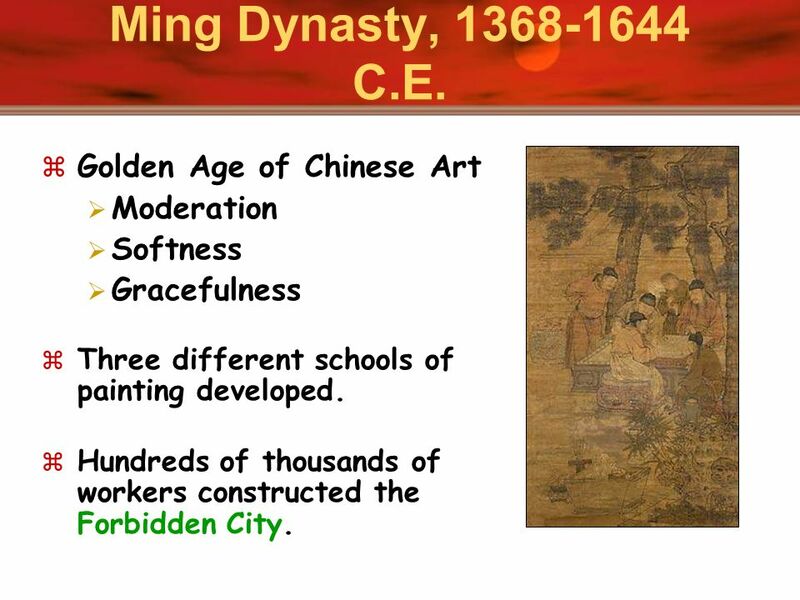 It brought Chinese together into one civilization, creating a common culture. Economically, it brought much wealth to the Han, as they exported much more than they imported. Wudi’s public schools taught Confucianism. Grand School in capital. In 100 years, 30,000 studied there. 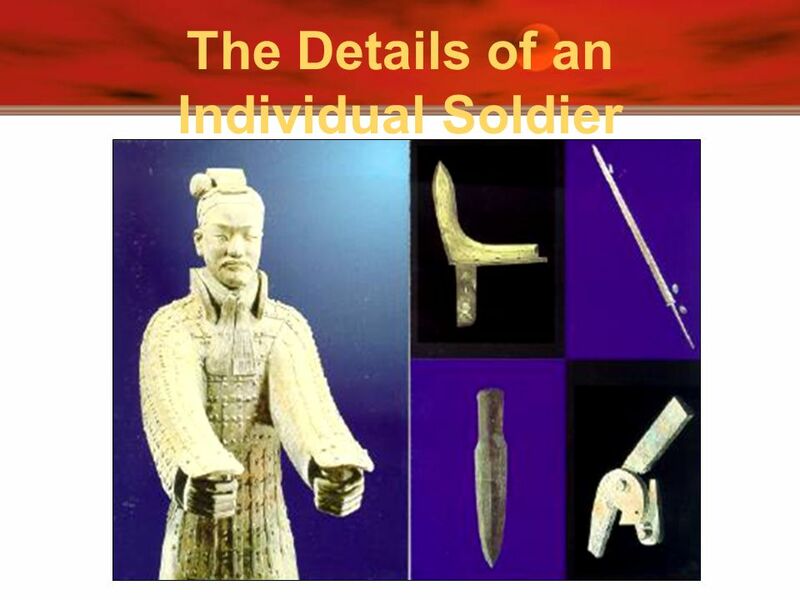 Download ppt "Imperial China: Qin to Ming Dynasties." 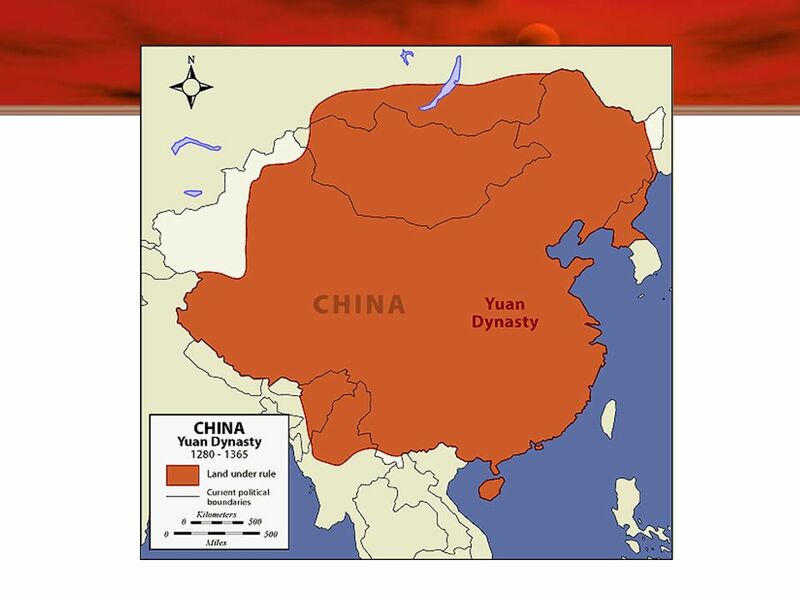 China A Visual Presentation By James and Aaron Lasted from Followed the collapse of the Han Dynasty Popularity of Buddhism and Taoism grew Period. 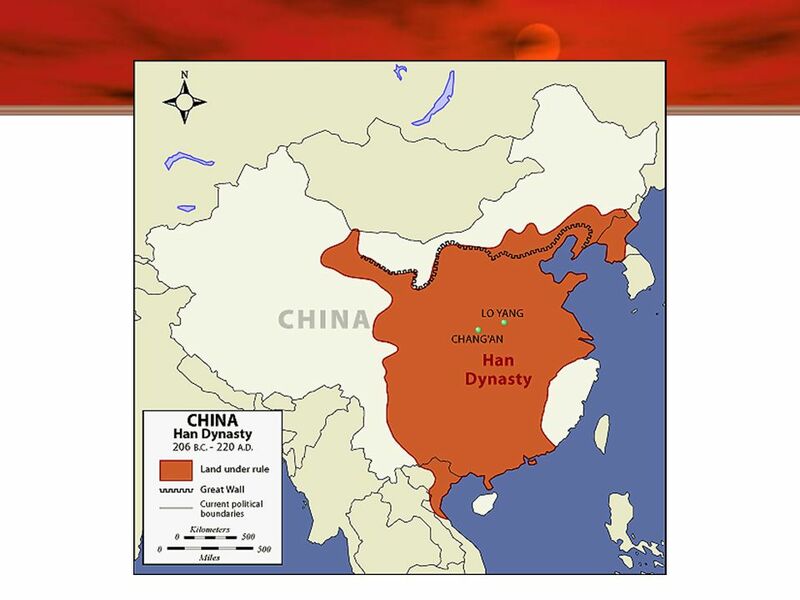 Period of Disunion After the fall of the Han Dynasty China split in to rival kingdoms. This period was filled with war. 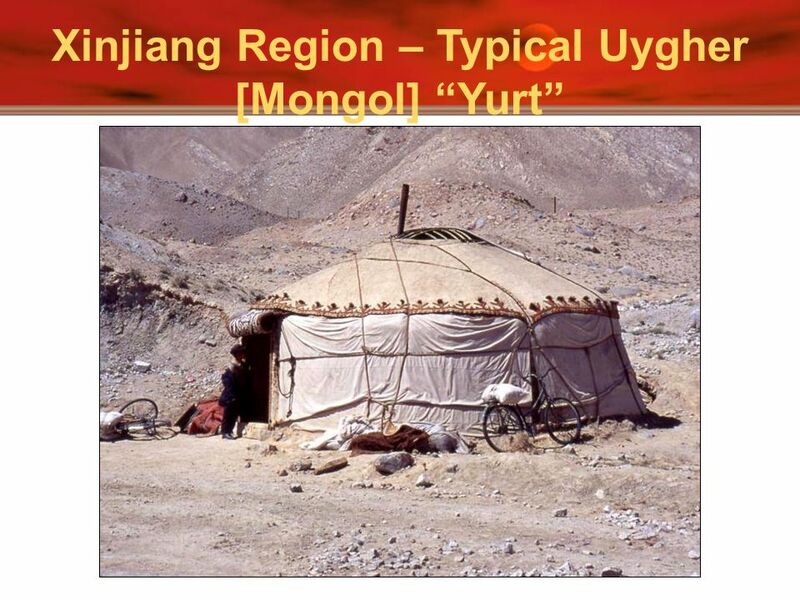 Many nomadic people settled. 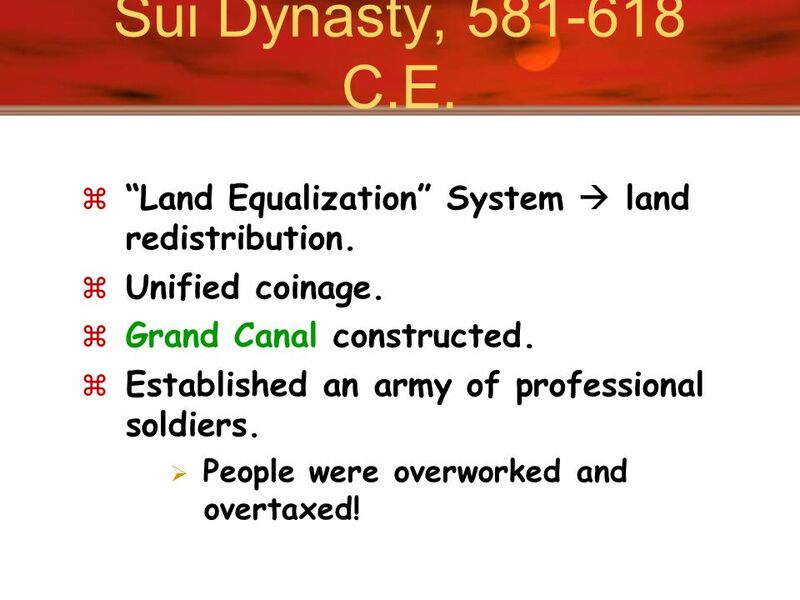 Chinese Dynasty Overview Shang to Qing AP World History. 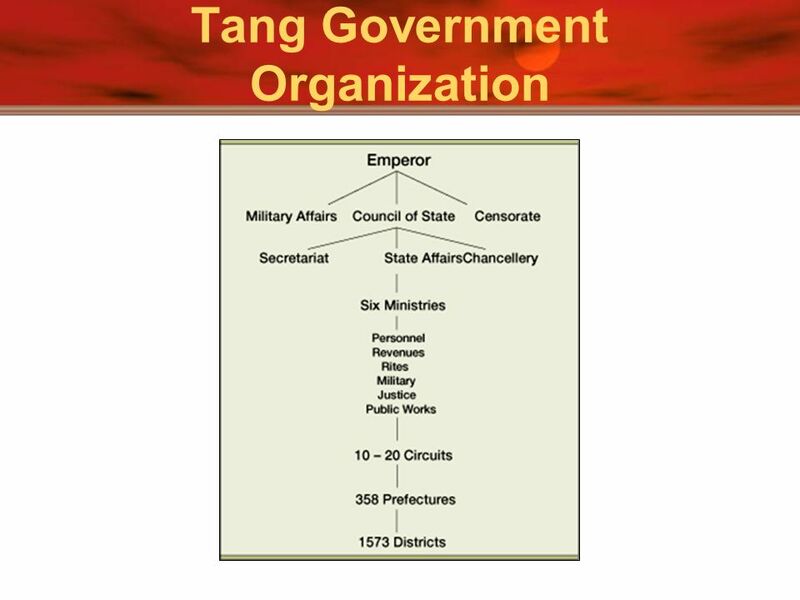 2/19 Focus: 2/19 Focus: – During the Tang and Song Dynasties, China was unified, government was efficient, and society was stable Do Now: Do Now: – What. Chinese Dynastic Cycle Rise: a leader defeats enemies and establishes a dynasty Golden Age: internal peace, expansion and great power; uses wealth to. Dynasties of China. Shang ( BC) (Hammurabi, Hittites, Olmec) First recorded Dynasty (Xia-no written records) Ruled by aristocracy: were of the. The Family Family is center of society More important than the individual or nation 1 st responsibility is always to the family Household Can have up. 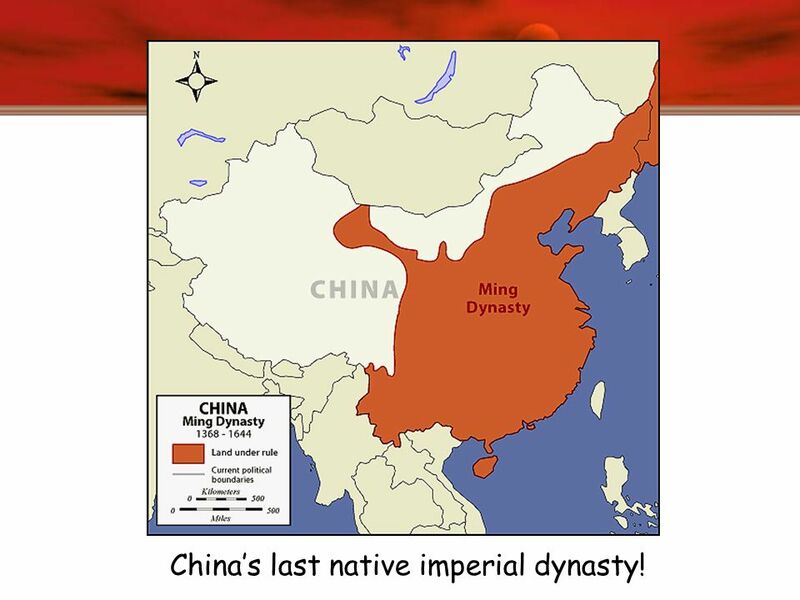 How was China affected by global changes during the Qing Dynasty? Period of Disunion 220 – 589: After the fall of the Han Dynasty China split into rival kingdoms This period was filled with war Many nomadic people settled. AP World History.  End of the Han Dynasty was followed by a long period of disunity and civil war  Buddhism began to spread throughout China during. 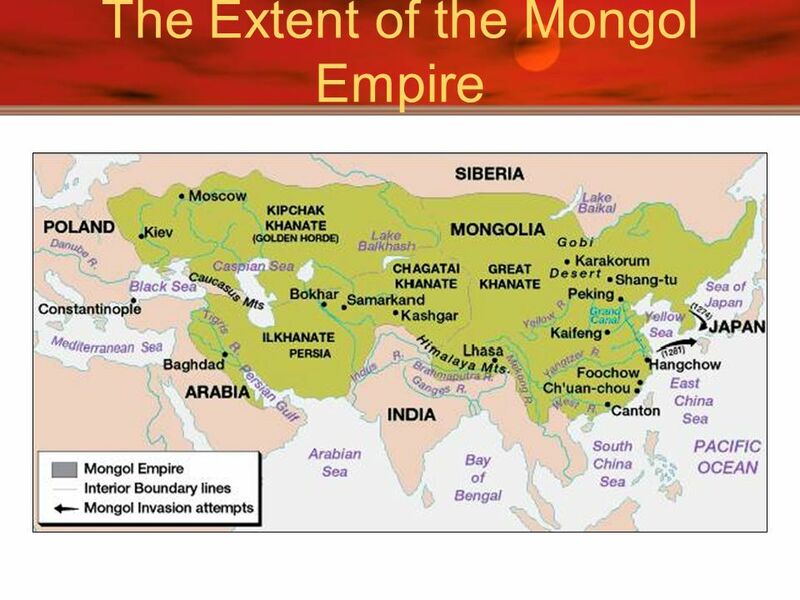 The Mongols & Their Impact On China. 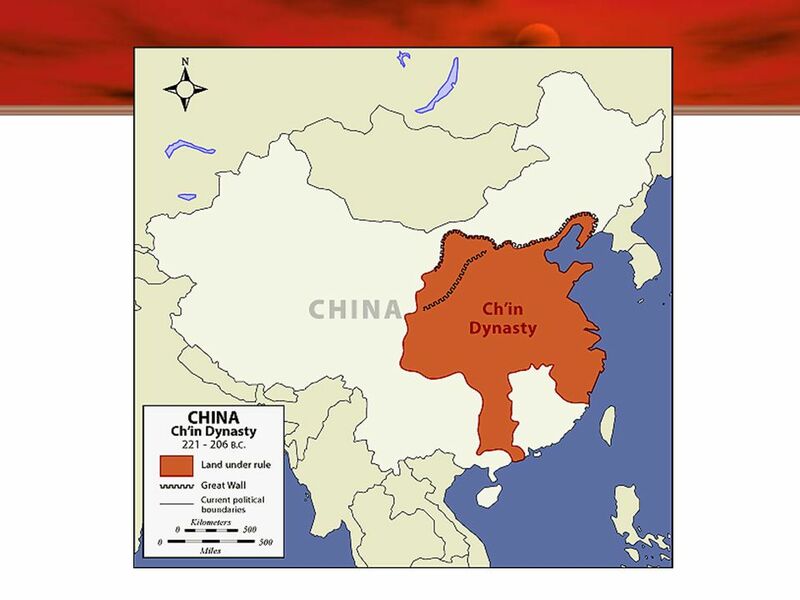 Unit XVI – China of the Middle Ages China – The Dynasties of The Golden Ages through the 20 th Century Copyright 2006; C. Pettinato, RCS High School, All.